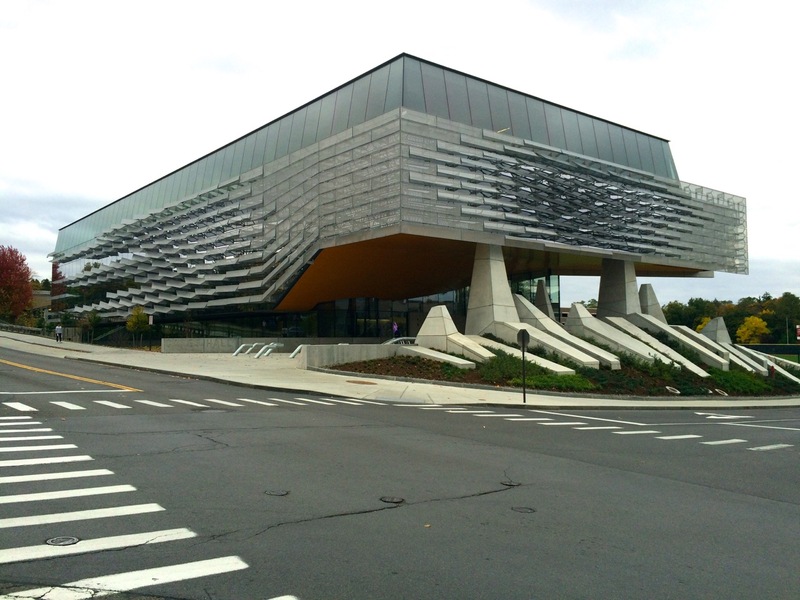 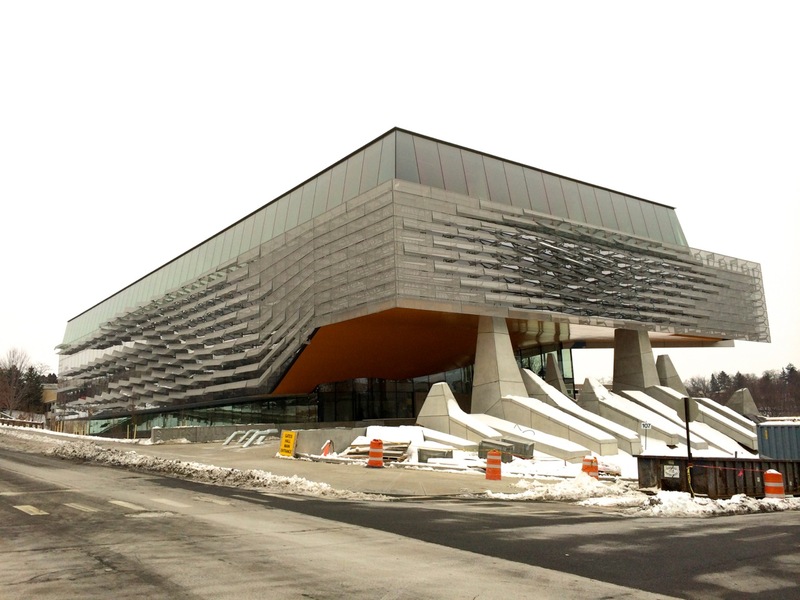 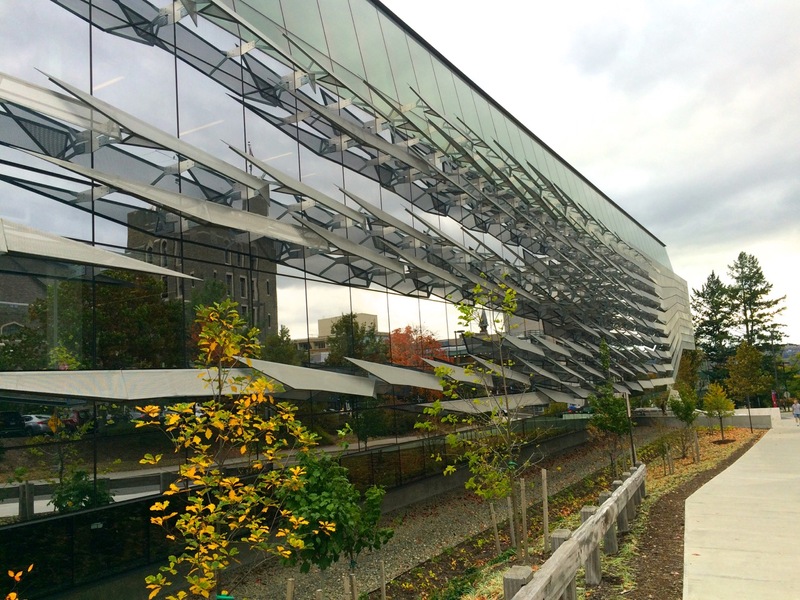 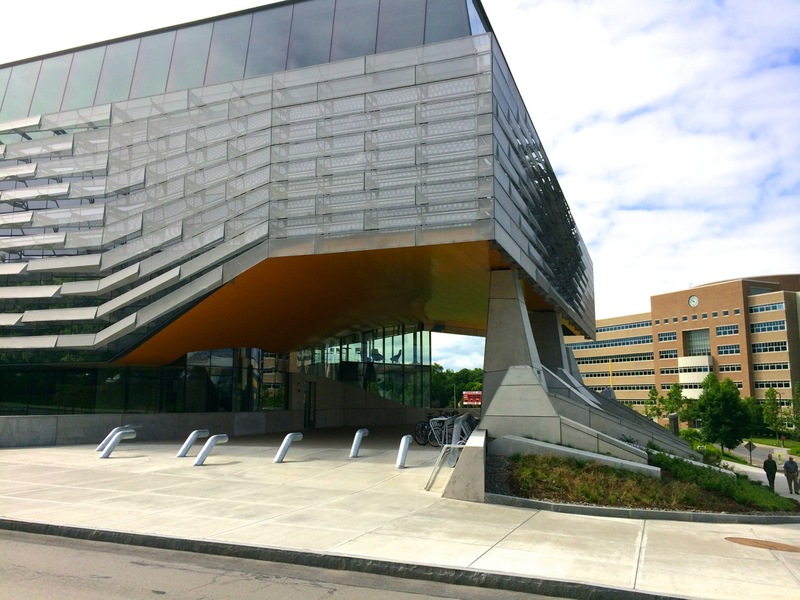 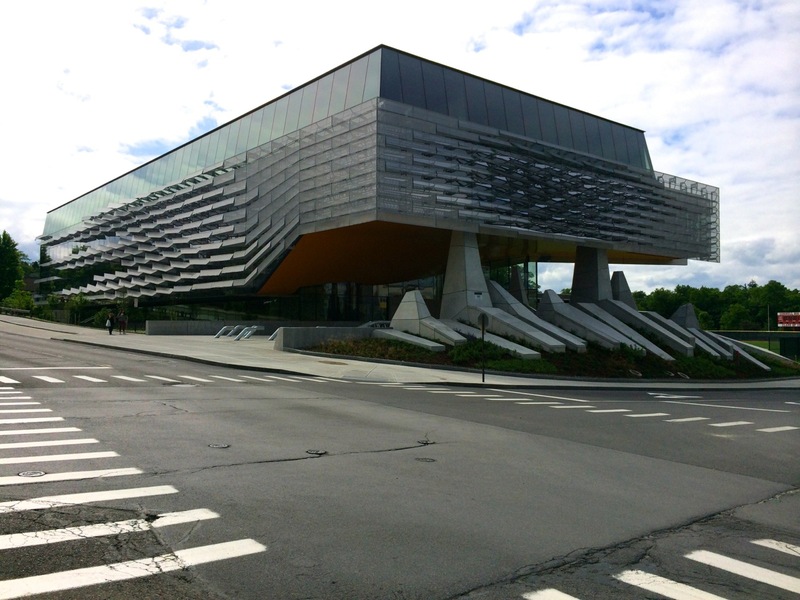 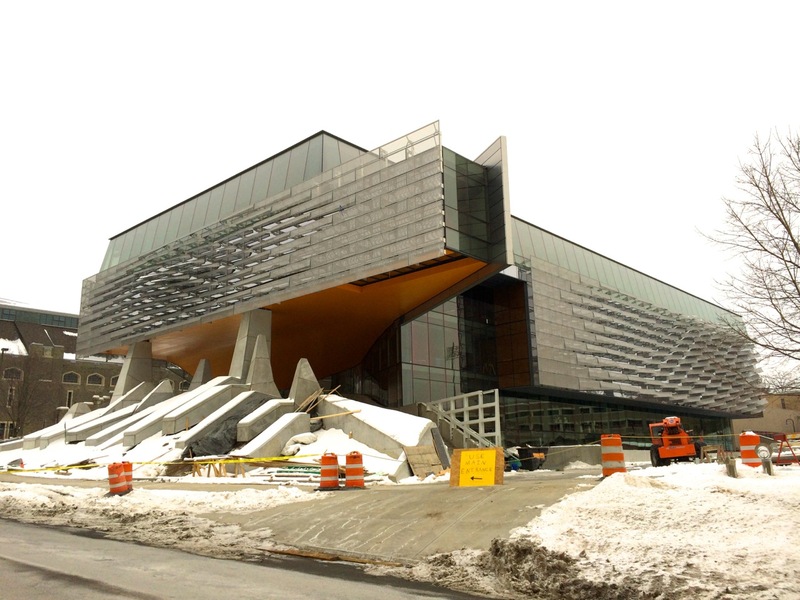 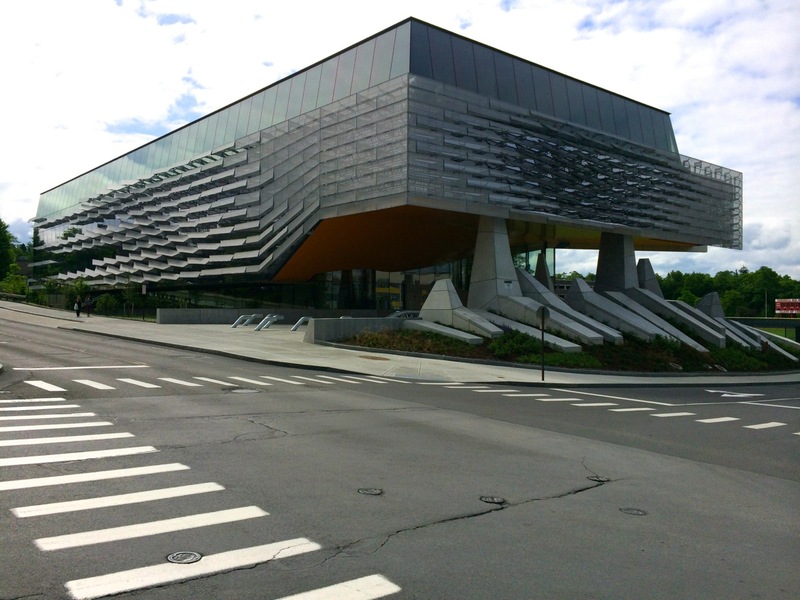 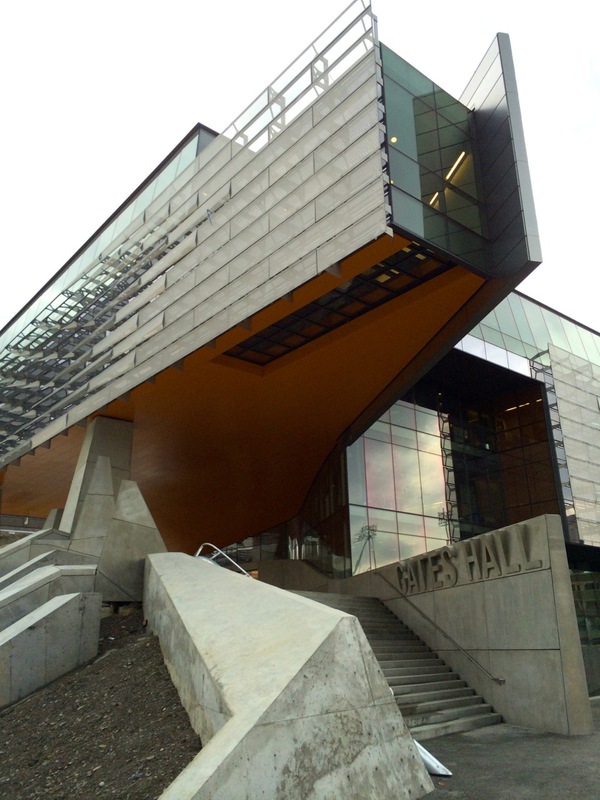 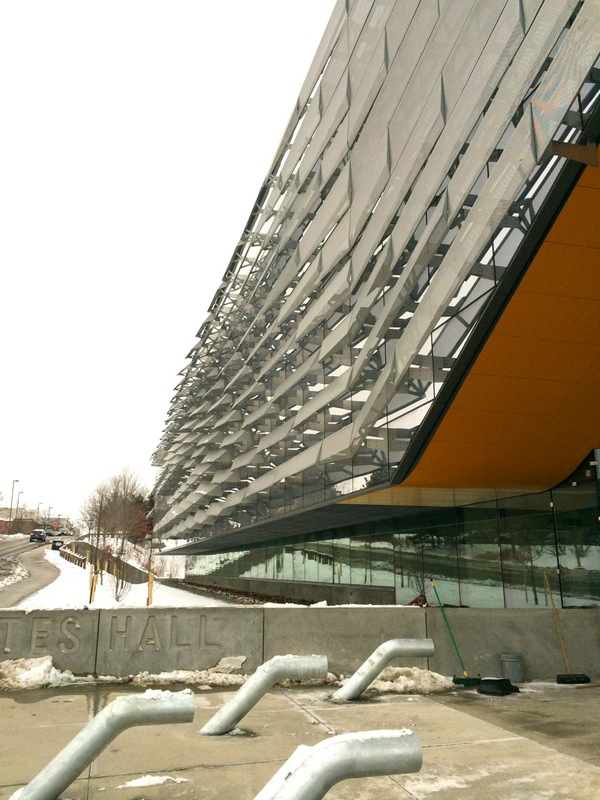 Quite possibly the most unique-looking building in Ithaca, the recently dedicated Gates Hall wears a facade mainly composed of glass curtain wall with an assortment of flat and angled metal shading panels produced by a company out of Kansas City, Missouri: Zahner. 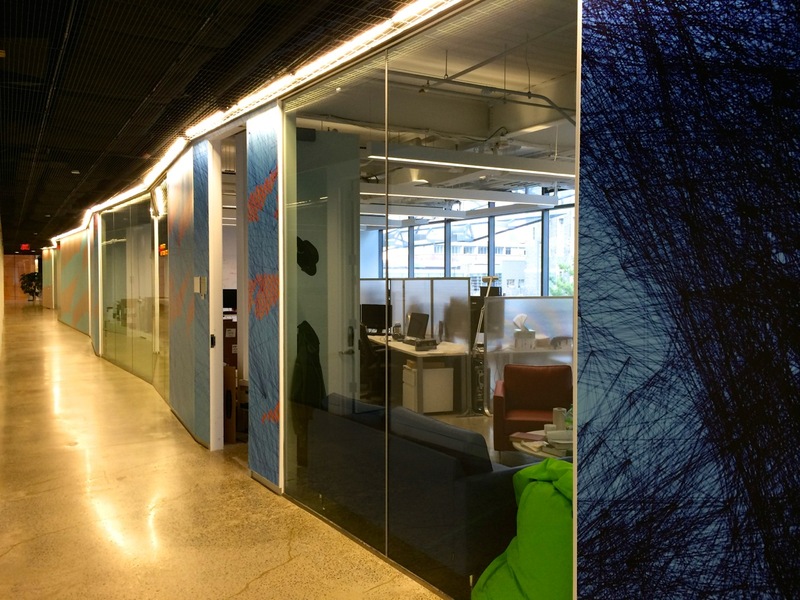 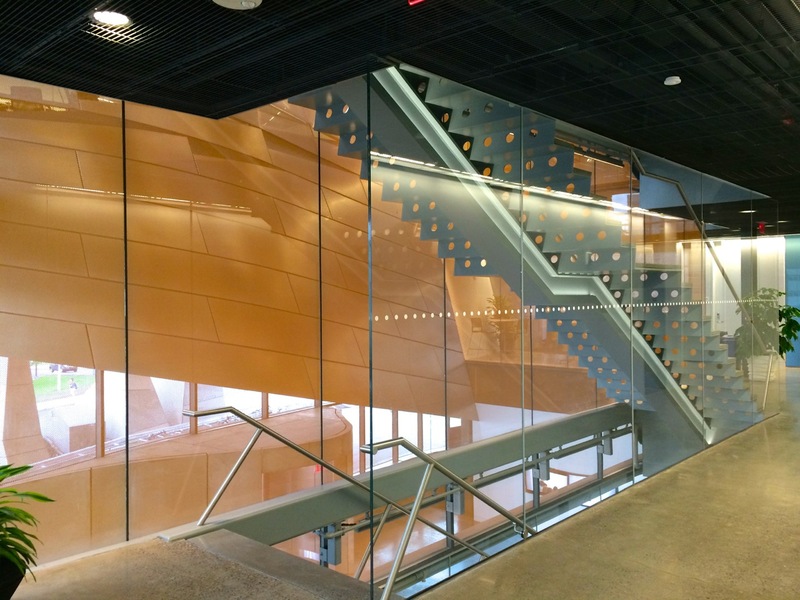 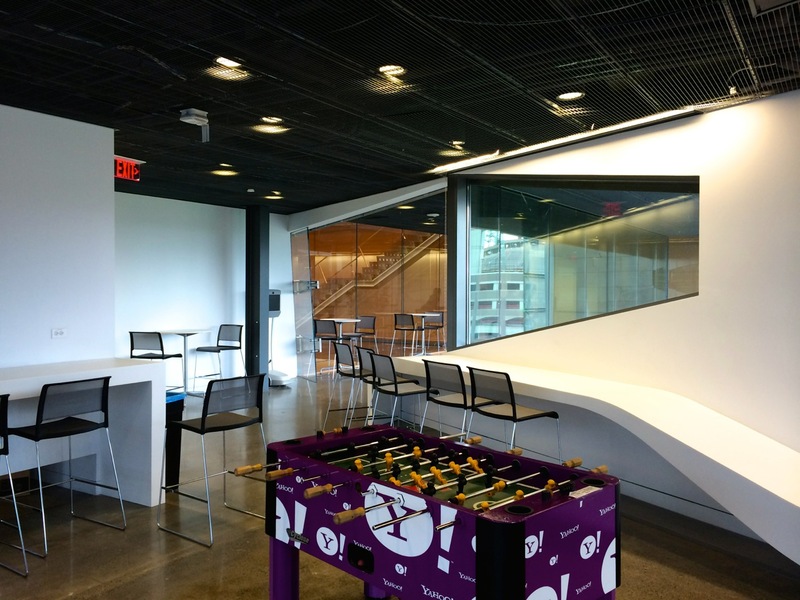 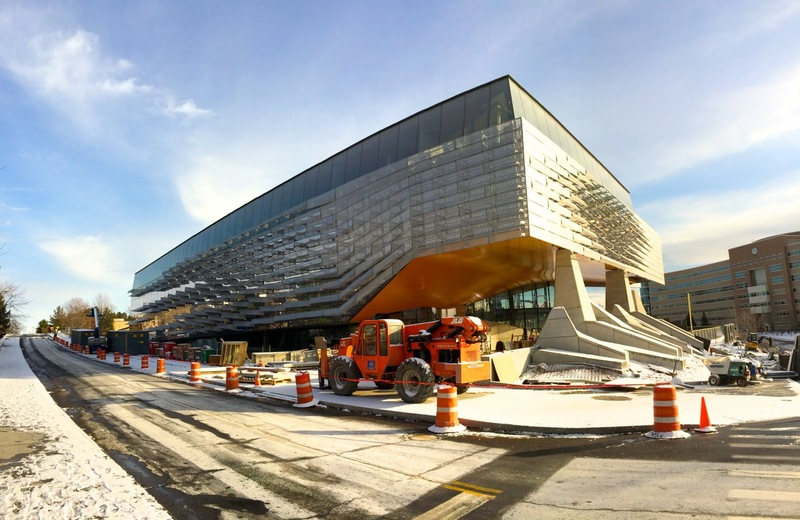 The group just released a nice web page detailing the design and installation process with the Architecture Team from Morphosis, the General Contractor Welliver, Structural Engineering firm Thornton Tomasetti, and glass installer W&W Glass. 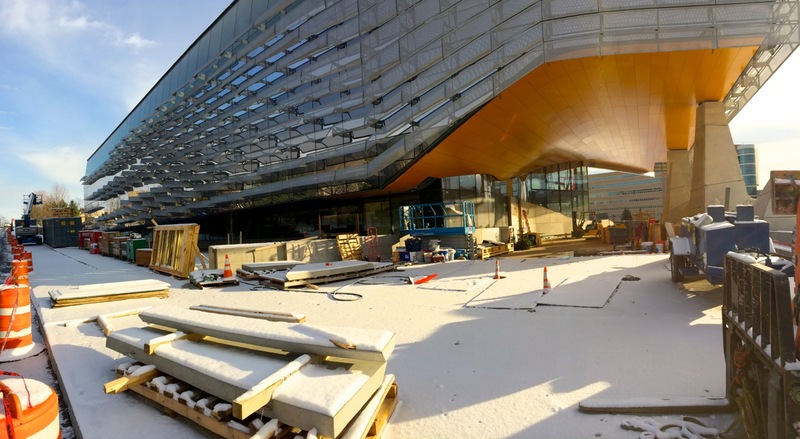 As facade systems have become more complex, the process has evolved to work-out as many pre-fabrication steps before arrival on-site, then as panels are installed, photos from the site are compared with the full 3D model for verification. 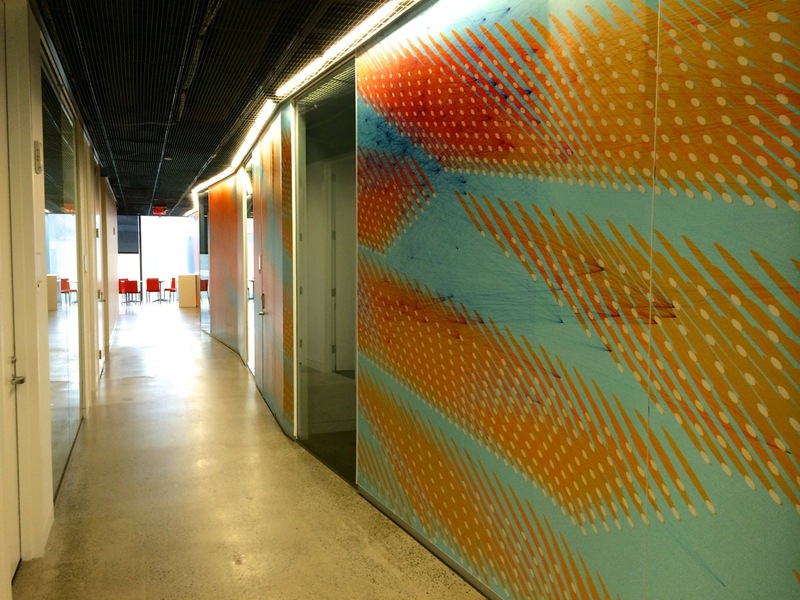 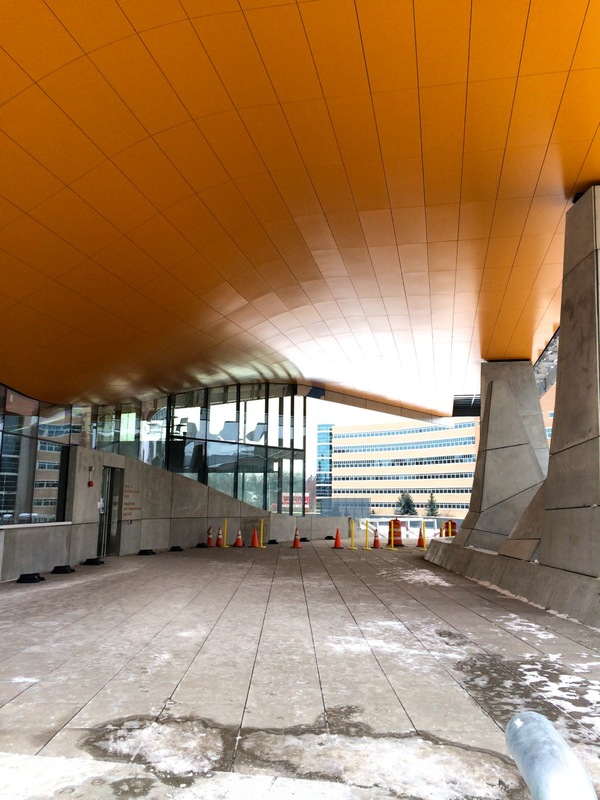 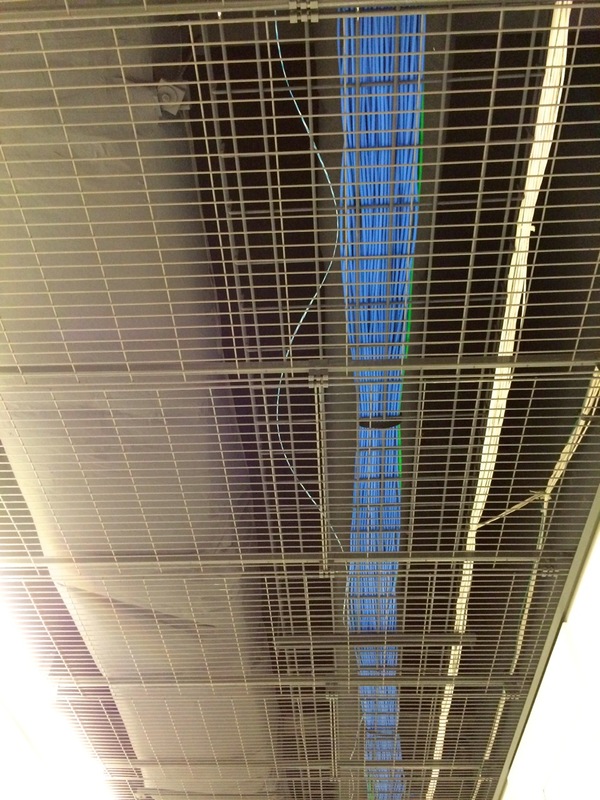 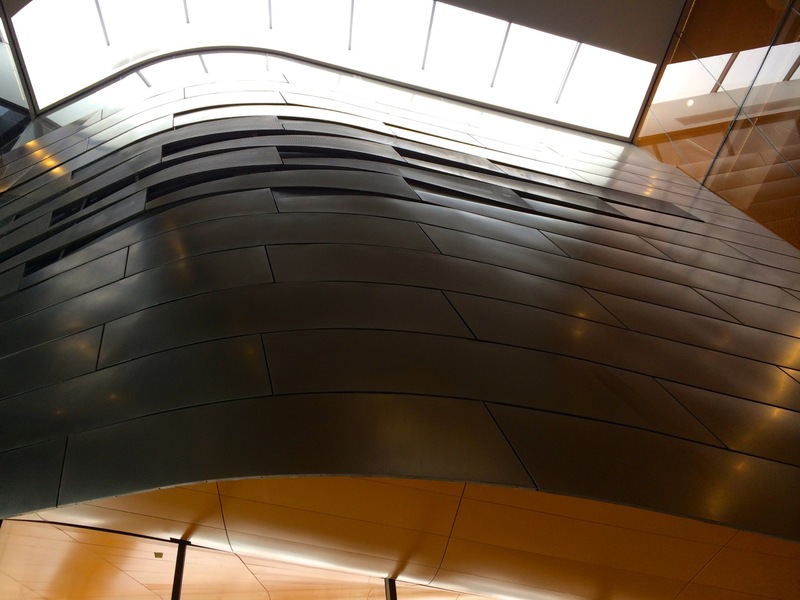 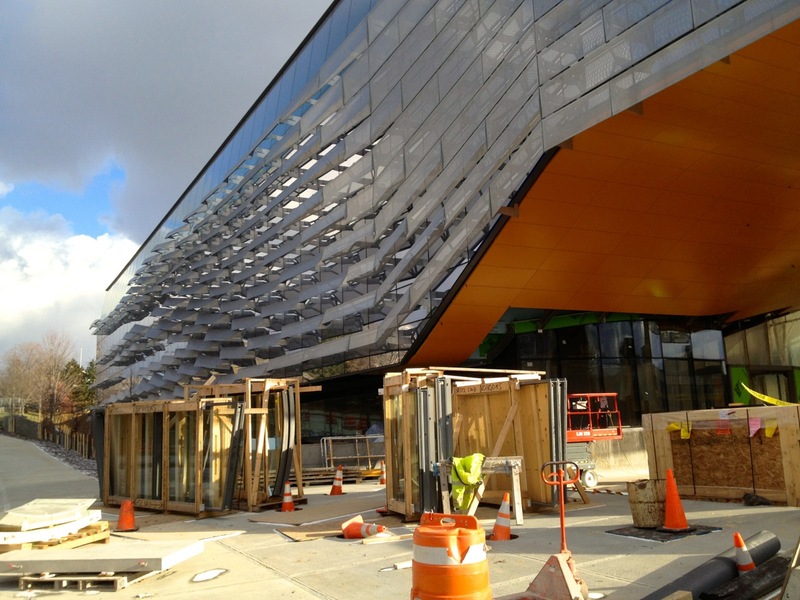 The same technique was actually employed for the new Barclays Center in Brooklyn, designed by SHoP Construction. 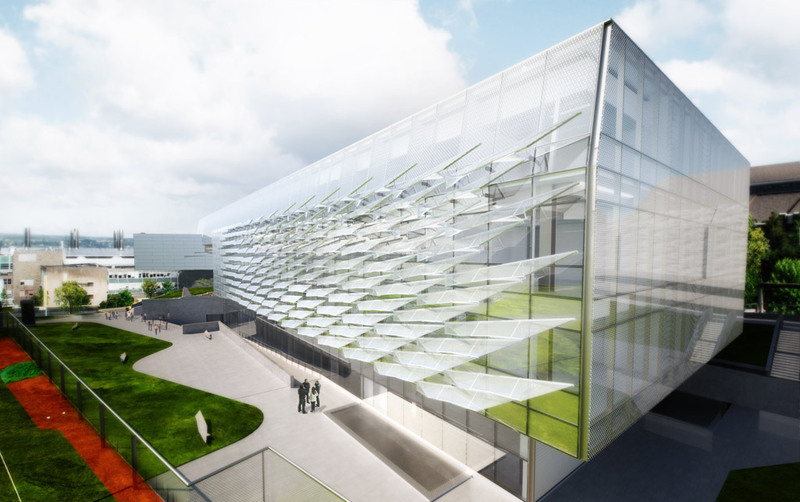 In addition to the aesthetic purpose, the panels actually block a precisely calculated portion of sunlight to limit solar gain (too much extra heat from the sun, driving up cooling needs). 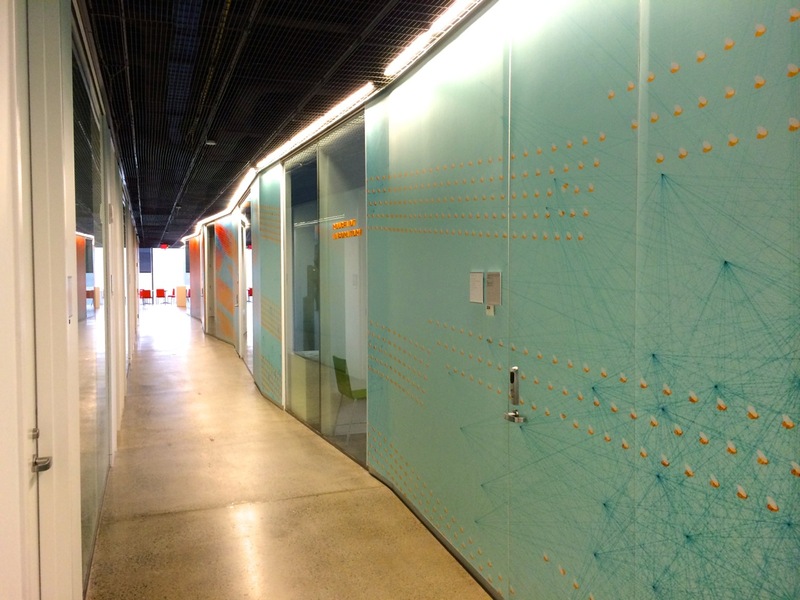 Got a chance to swing into Gates Hall and take some more interior photos since last time, so here are some shots from the hallways, common areas, and a few rooms. 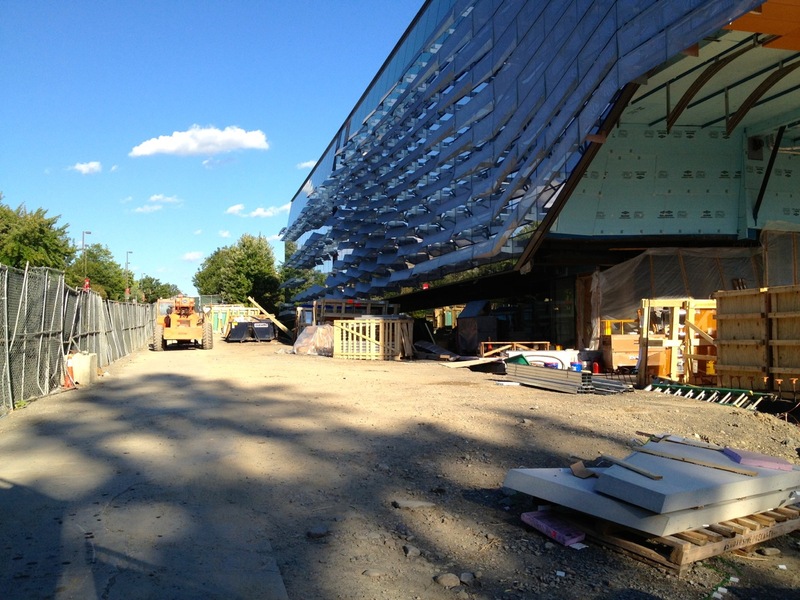 Not sure when the steps out front will be completed, but the interior has some nice eye-candy, and a great view of Hoy Field. 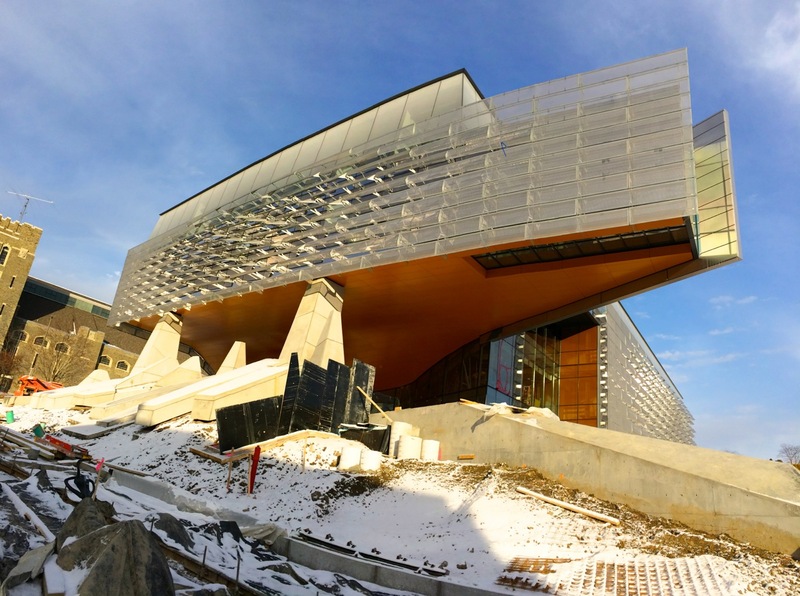 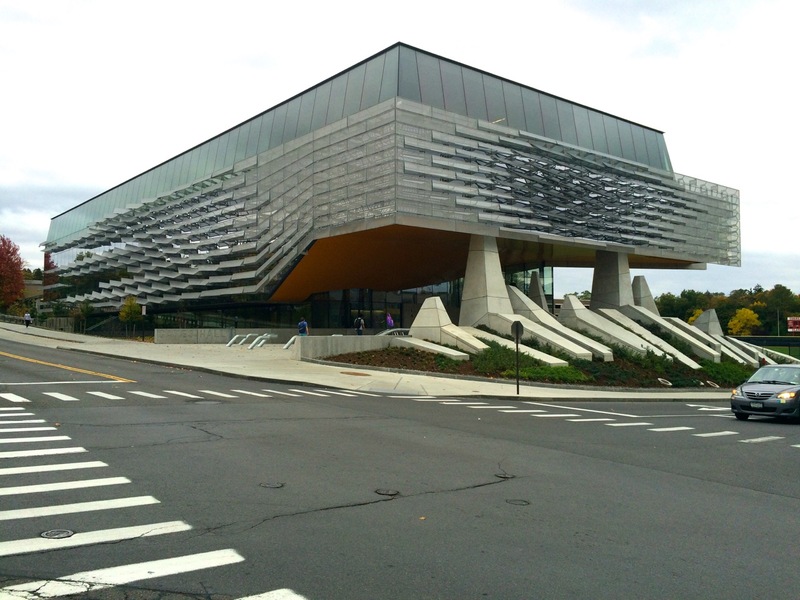 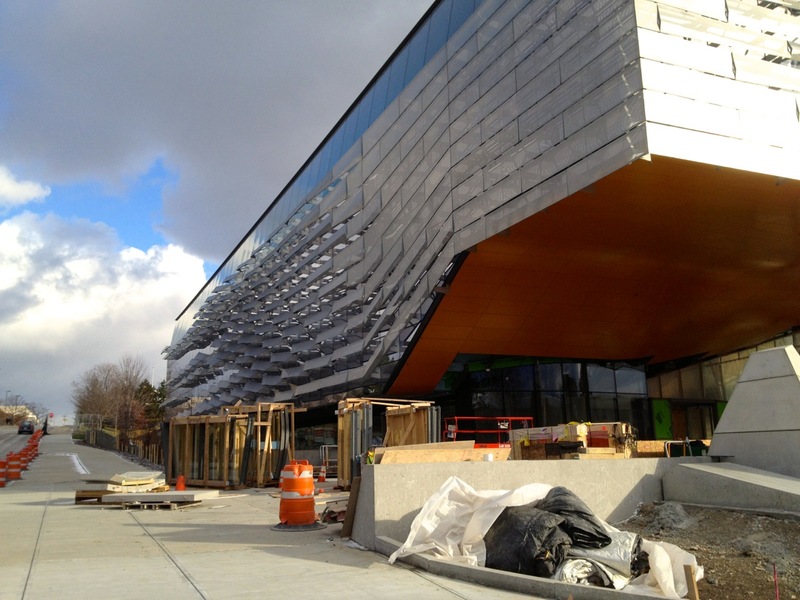 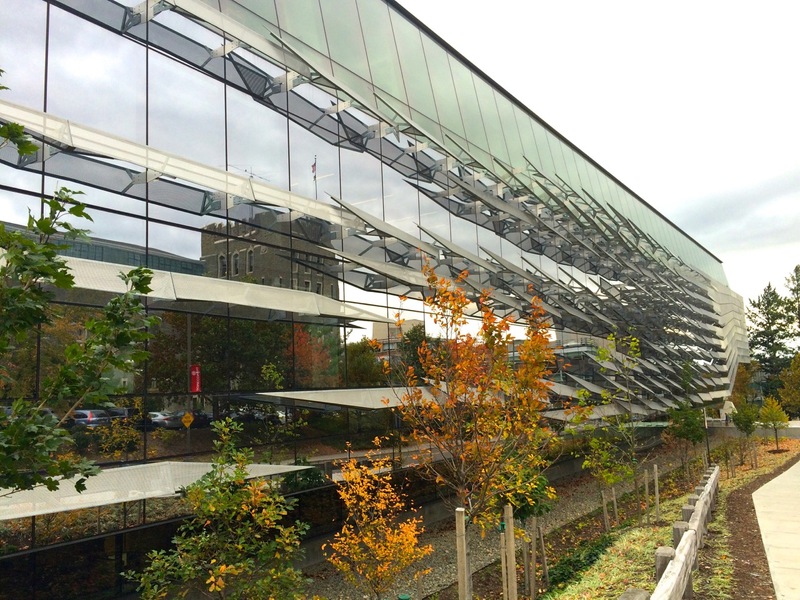 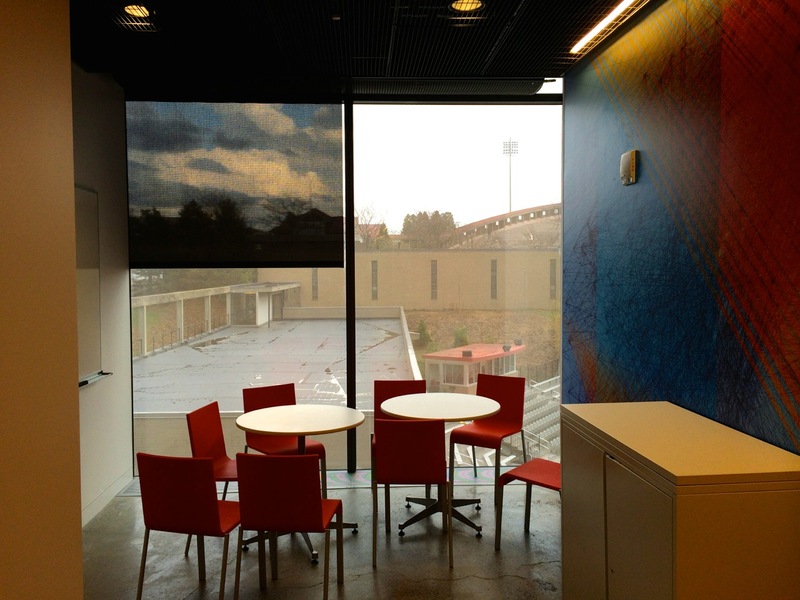 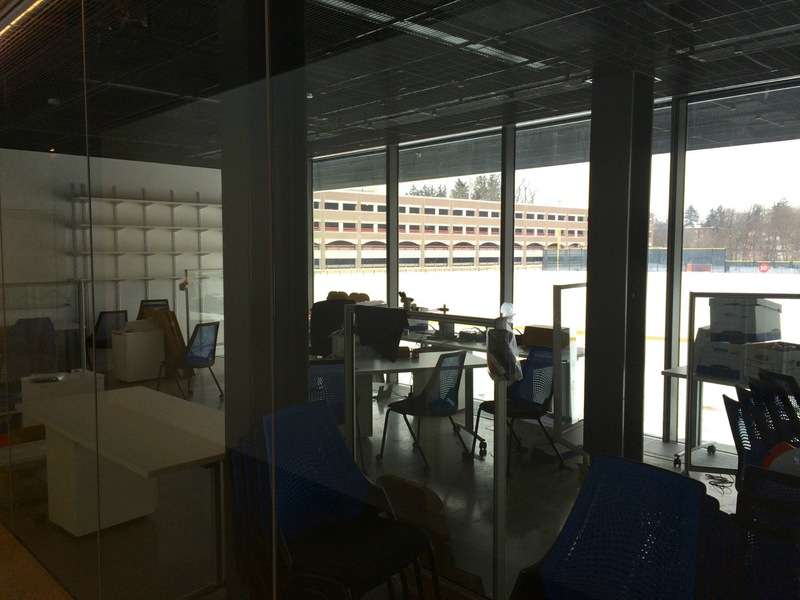 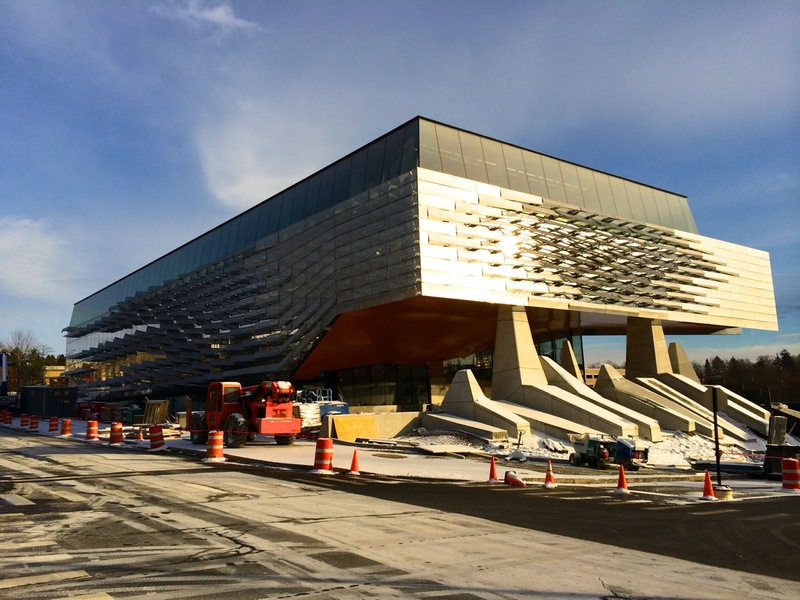 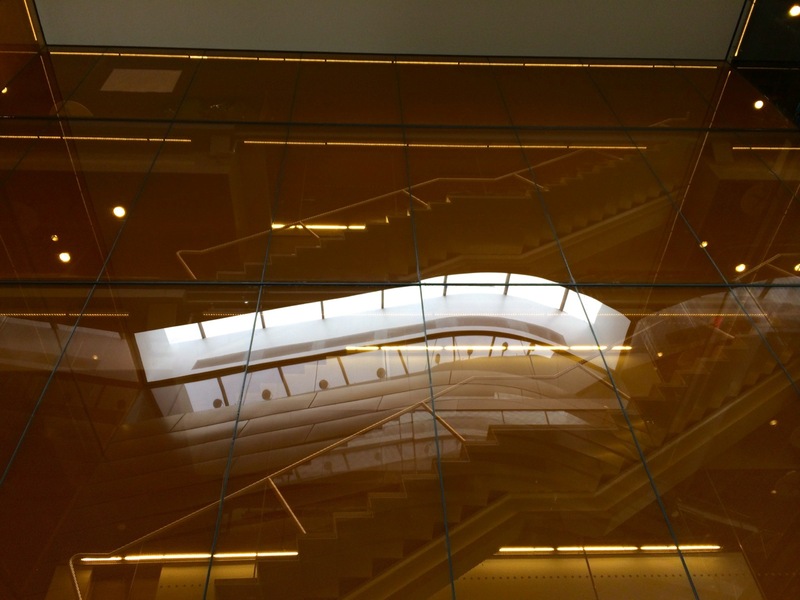 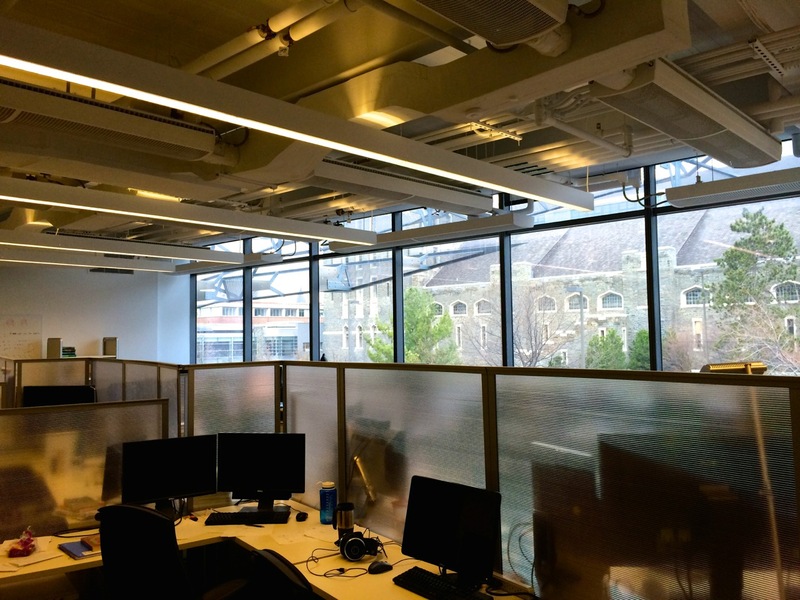 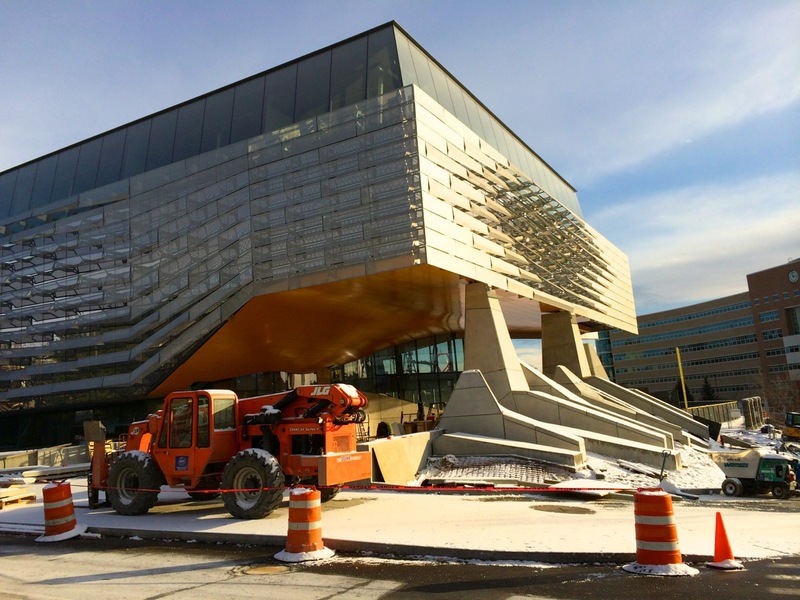 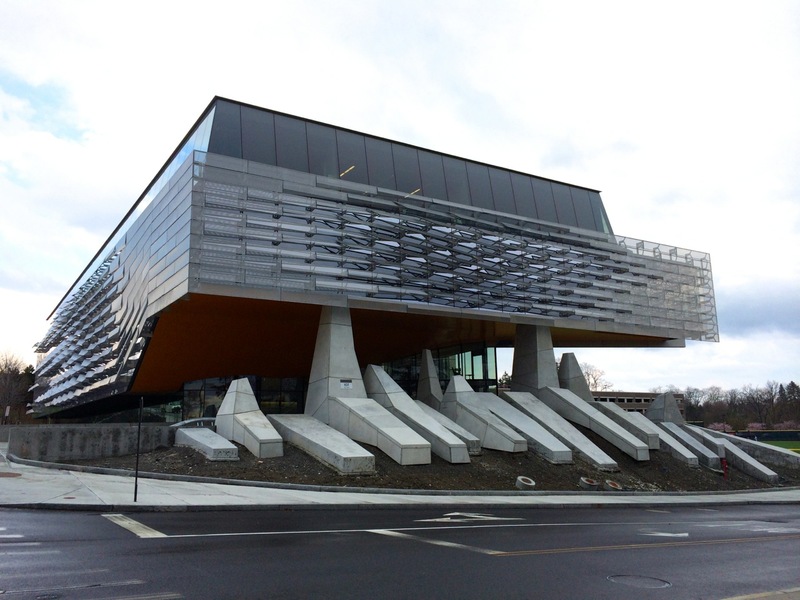 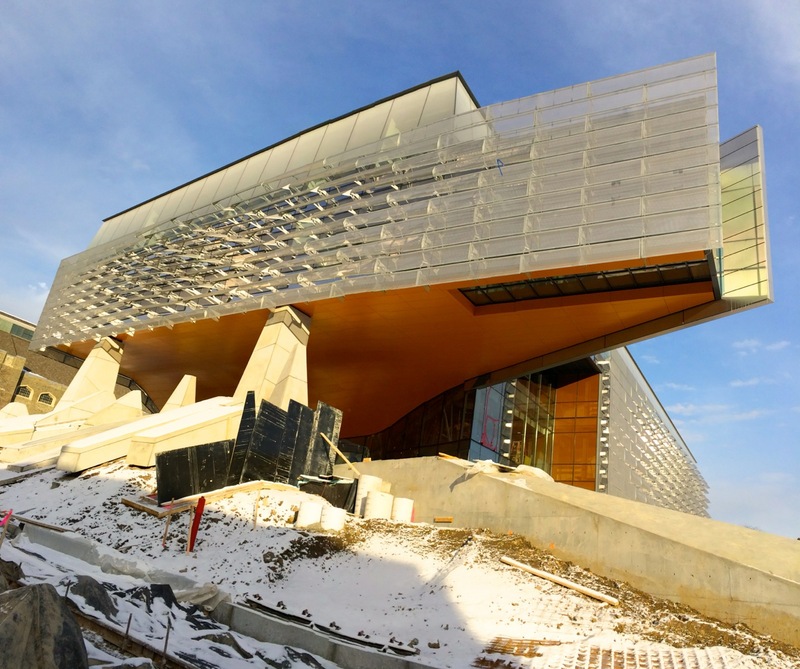 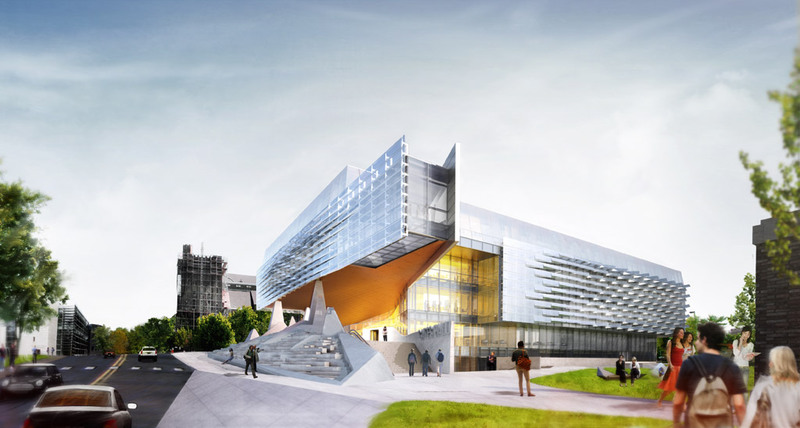 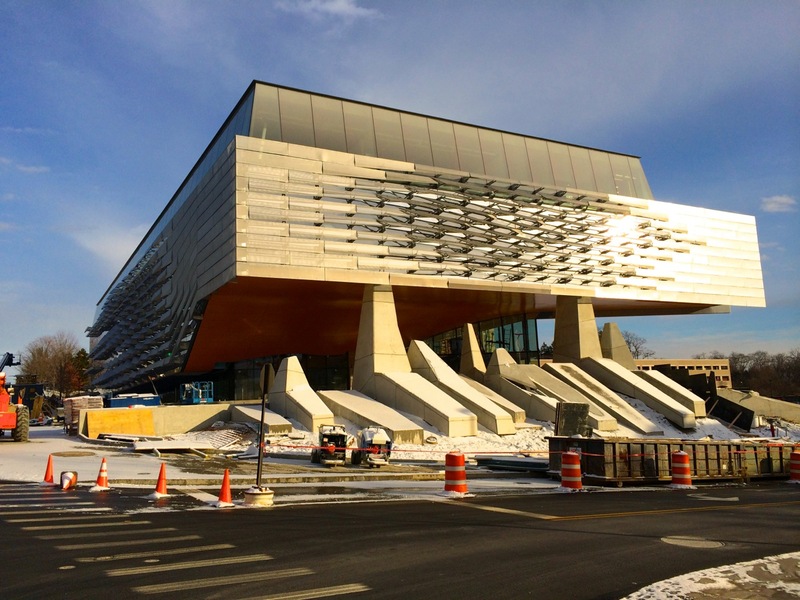 Cornell’s Gates Hall is just about complete, and move-ins for the Information Science Department have begun for faculty, staff, and a few classrooms/workspaces are set up. 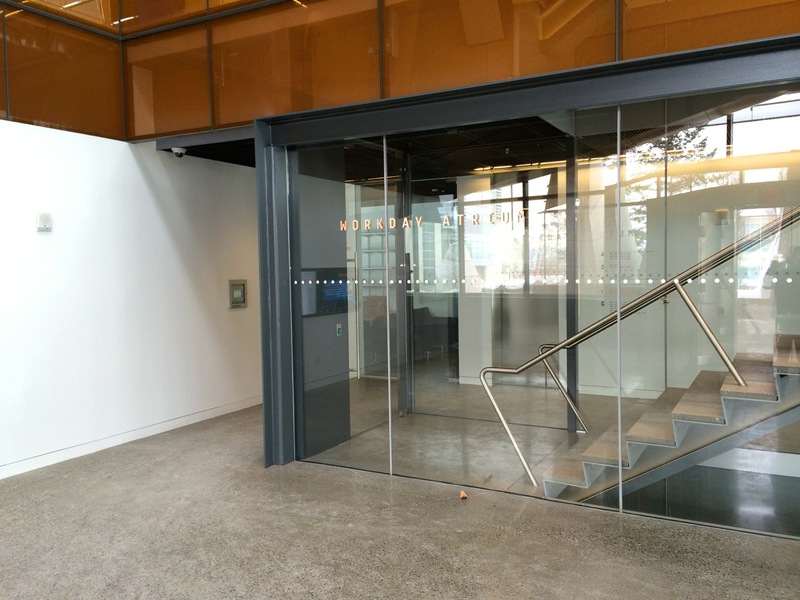 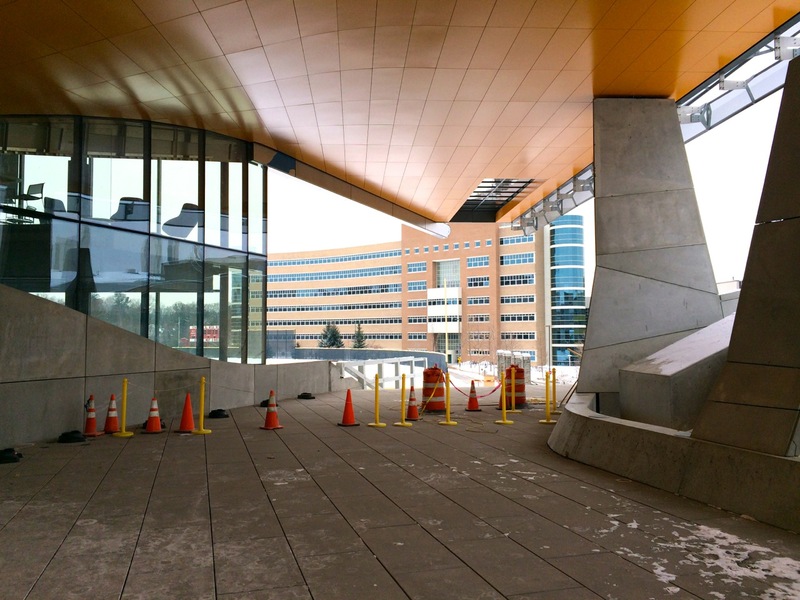 It’s pretty wild on the inside, and the entryway cantilever provides an interesting preview of that (plus, when the weather is nicer, I think it would provide a nice assembly space). 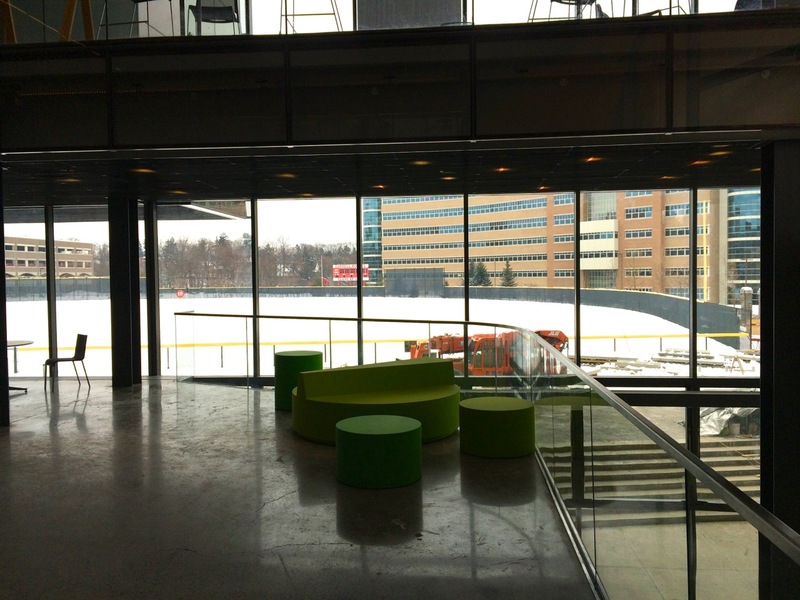 The lobby features semi-transparent glass, through which you can see the stairs up to each level, and clear glass panels for glimpses of each floor. 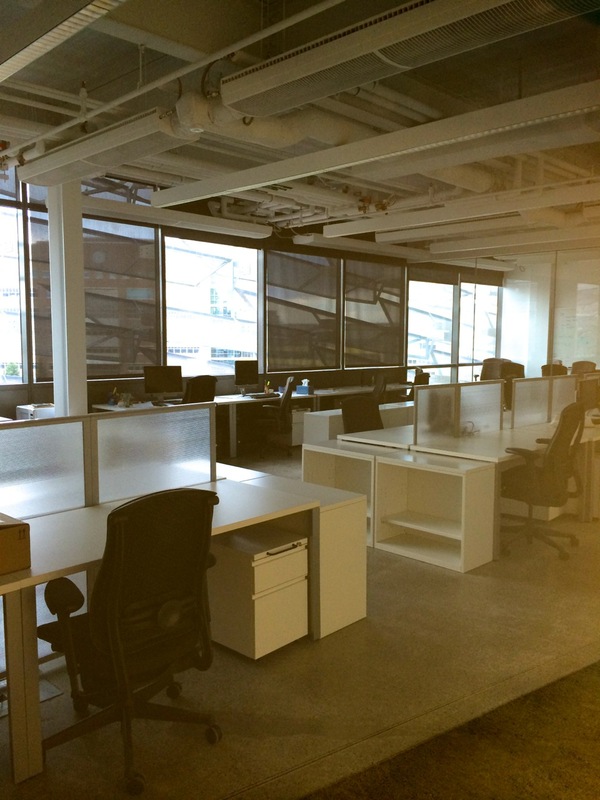 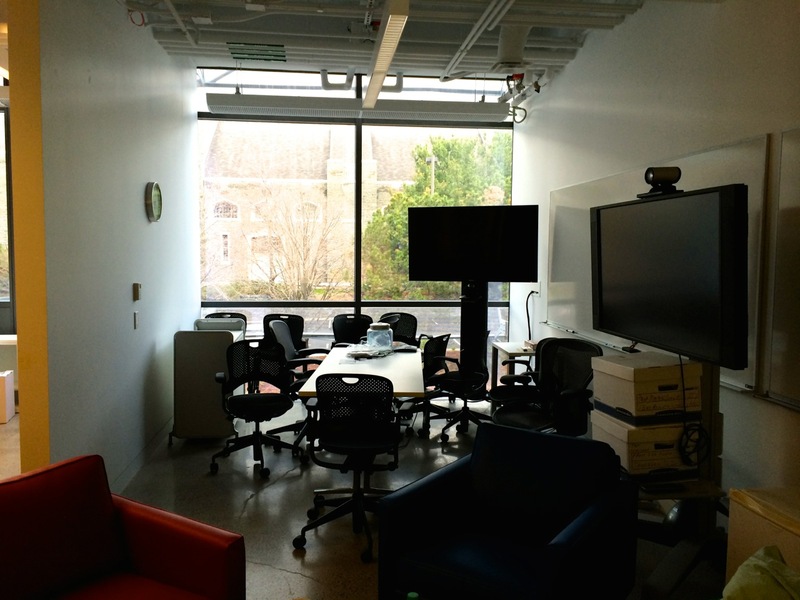 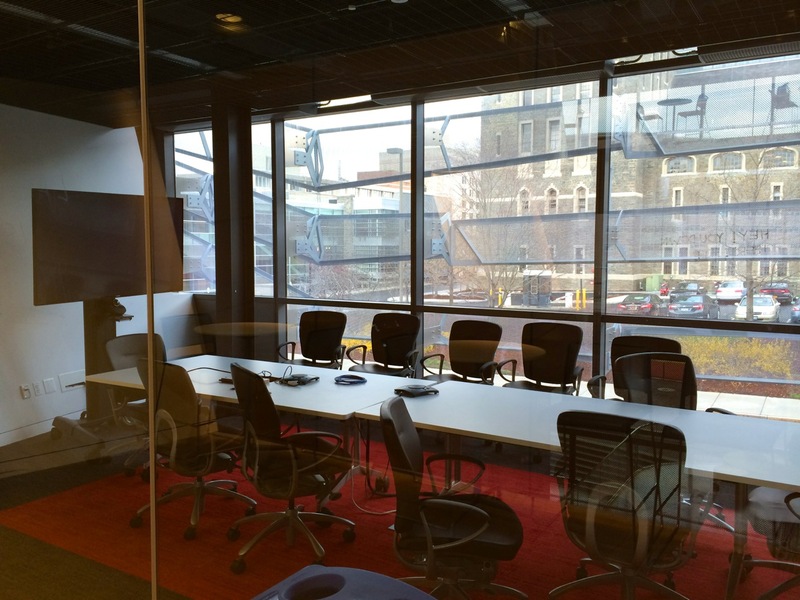 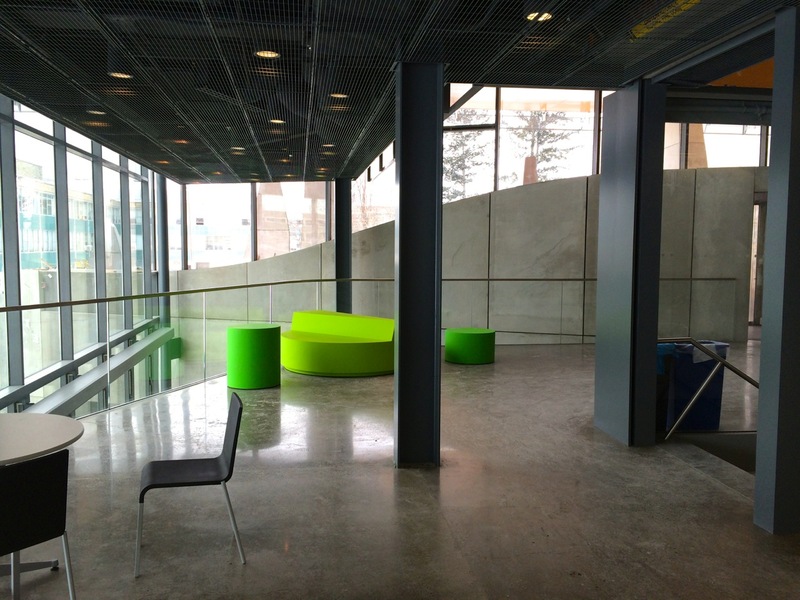 Many of the rooms are still being put together, but much of the common area furniture is already setup for use. 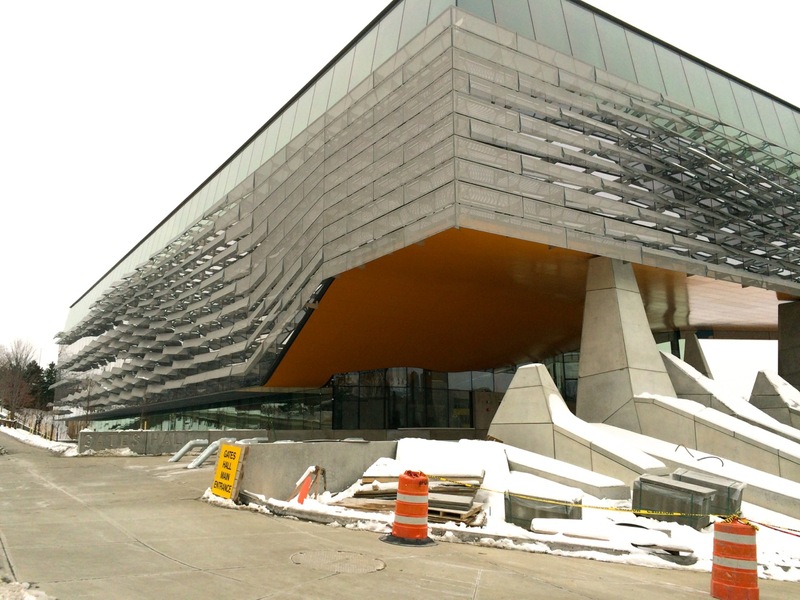 Besides the concrete features on the outside, I didn’t see any finishes on the inside that aren’t completed, although I bet there’s much work to be done moving everything over, hooking up computers and networks, etc. 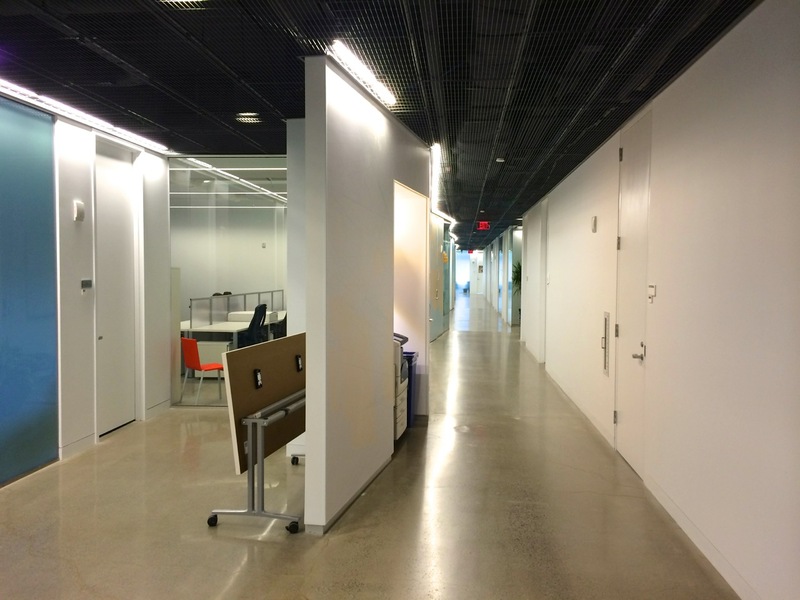 Moving an entire department must be challenging. 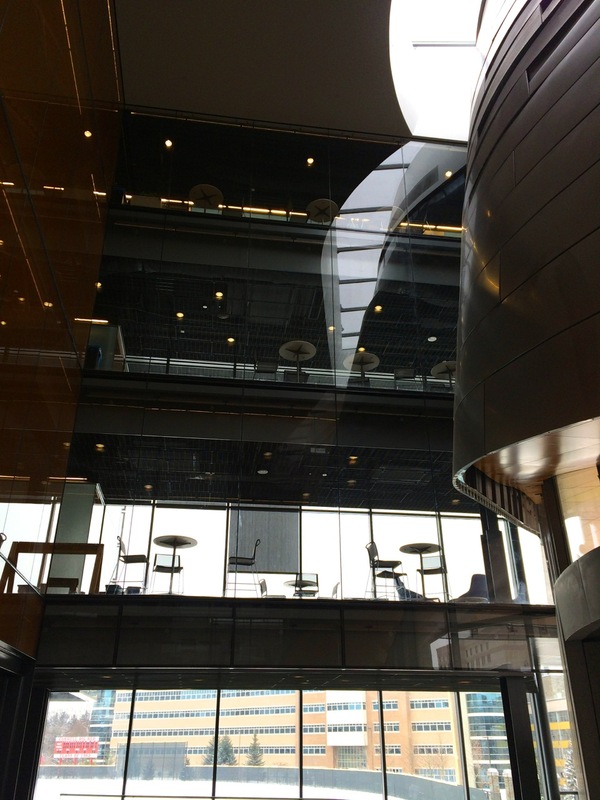 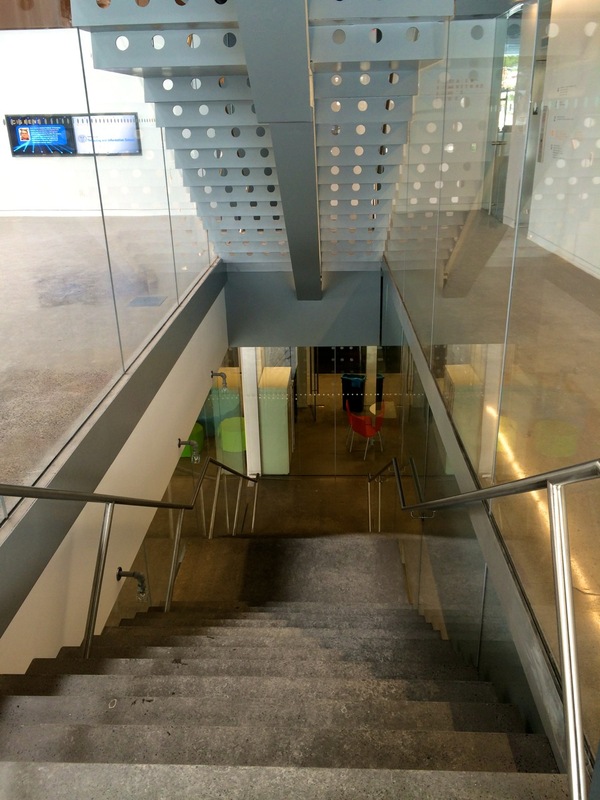 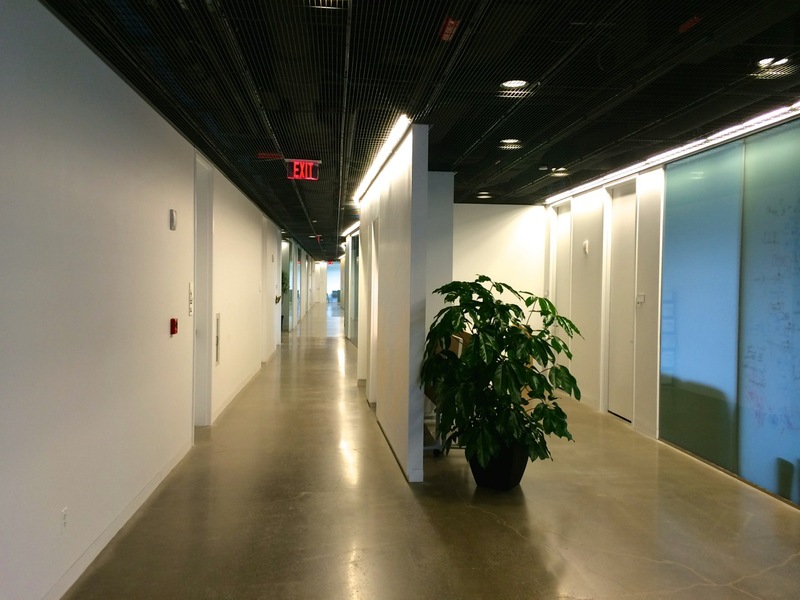 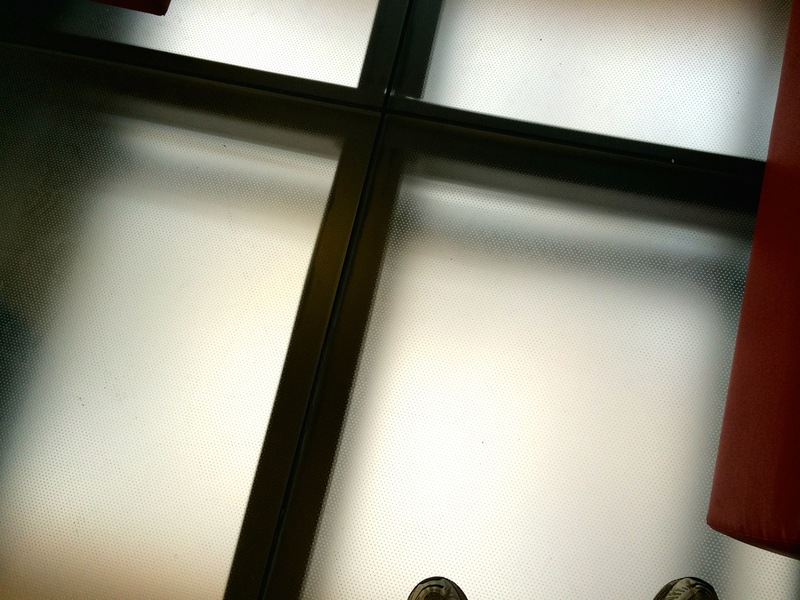 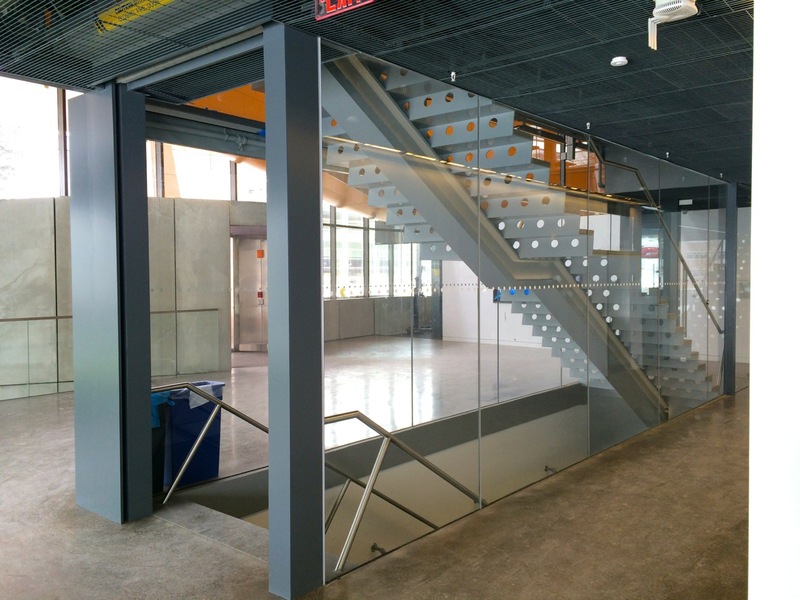 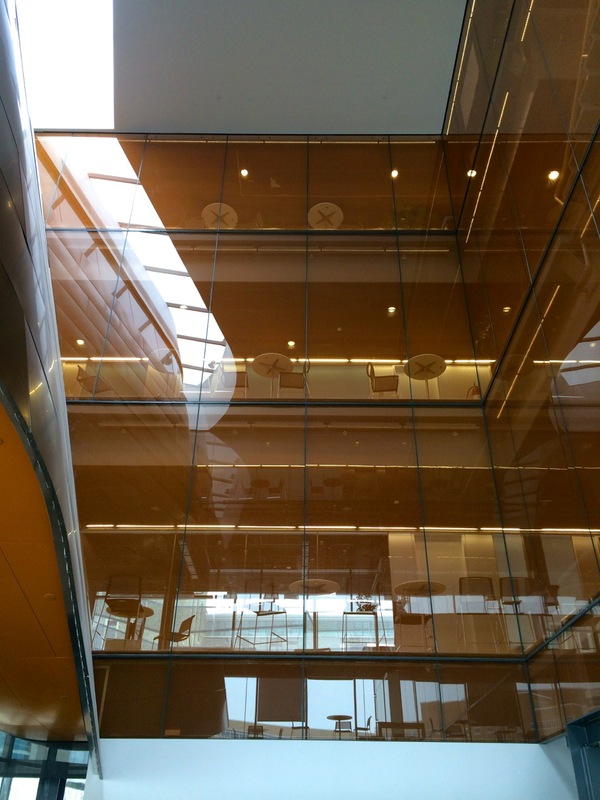 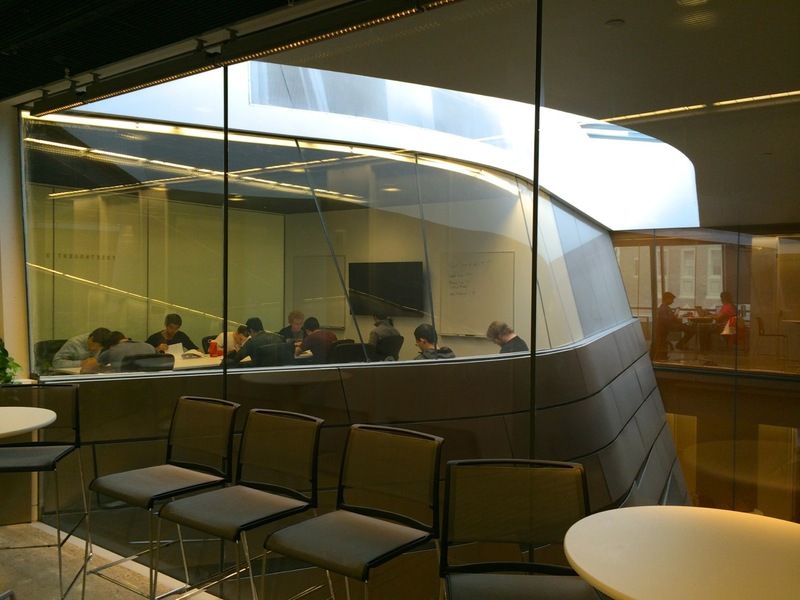 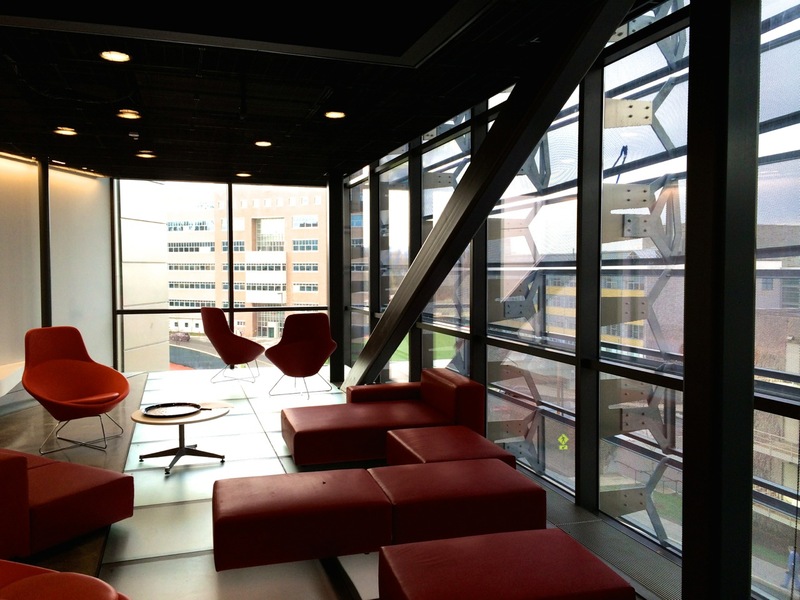 Floors are concrete, much like Milstein Hall, and there’s a bold amount of glass and steel everywhere. 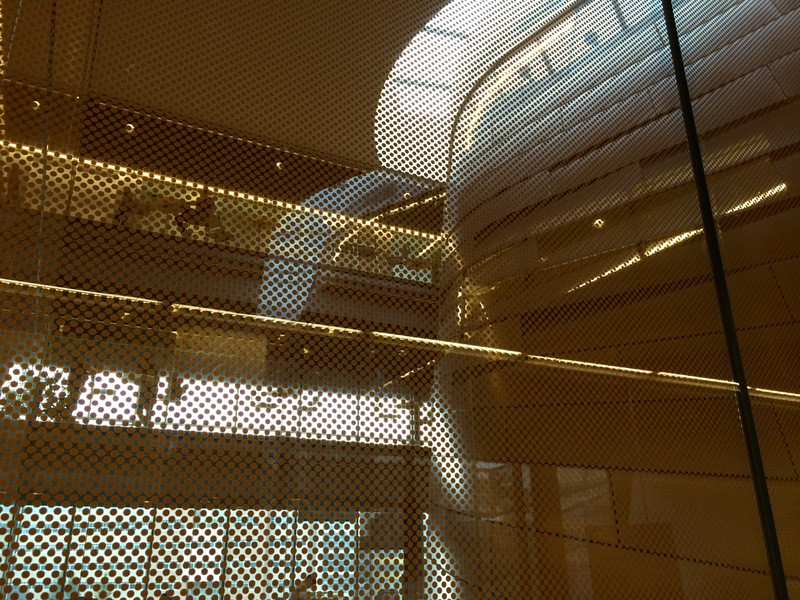 I’ll surely be coming back soon to explore much more- especially to walk around on the transparent floor at the end of the cantilever- vertigo anyone? 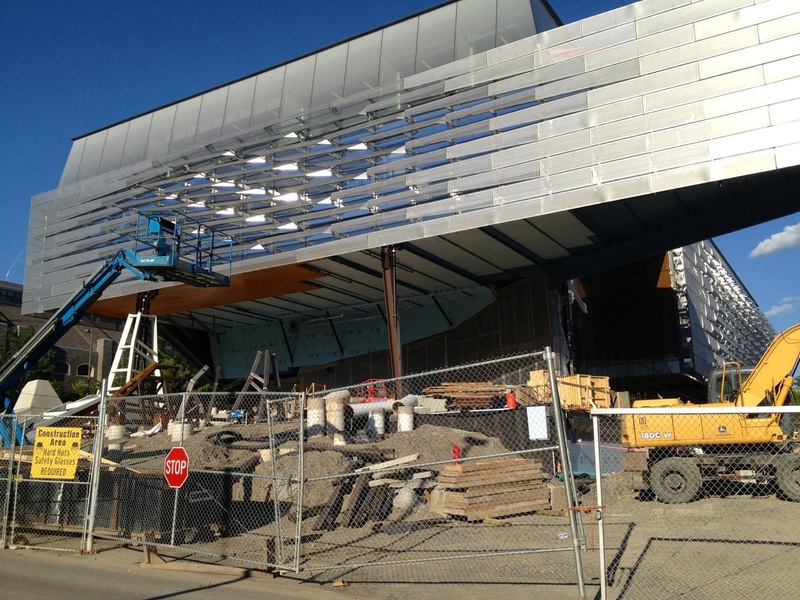 The entry structure is really coming together now, and with the fencing down, the view from the street is fantastic. 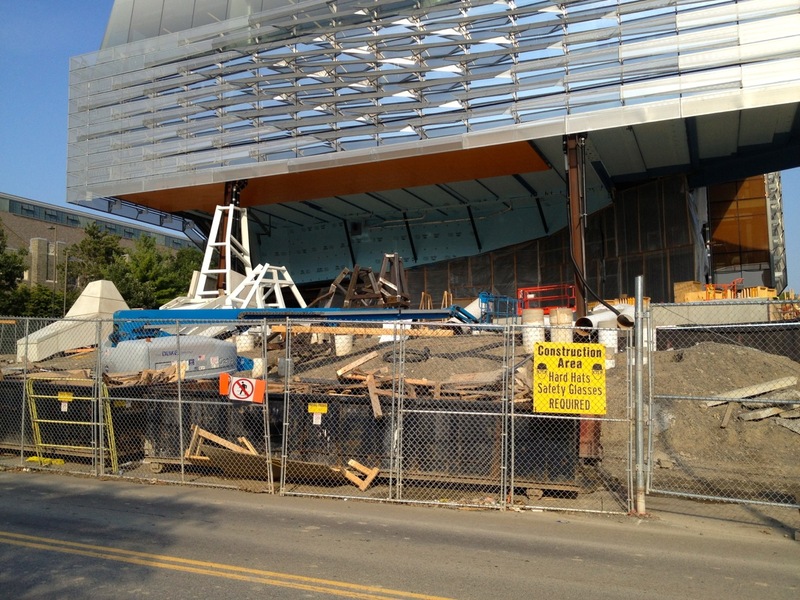 There’s a bit of framing to form concrete for the stepped entry along the southeastern end where the sign for the building will be attached. 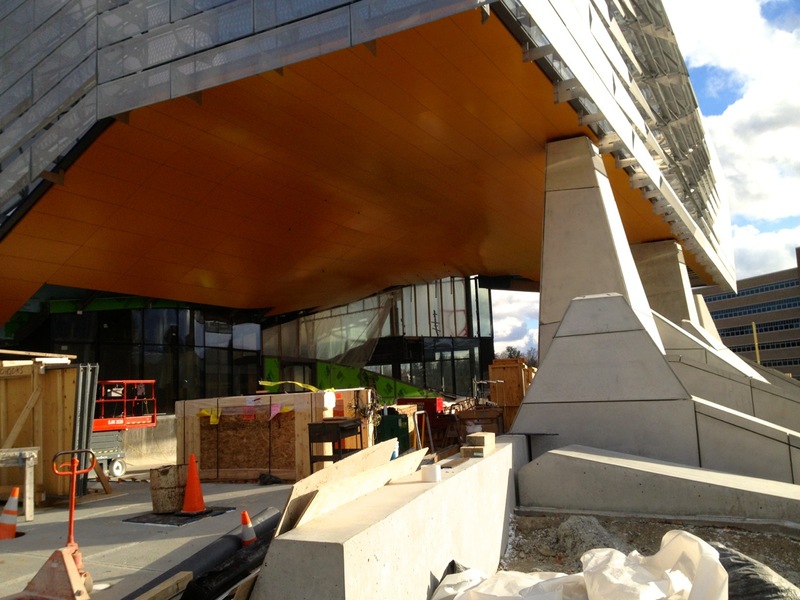 The entryway on that side will match the shape of the cantilever above to create an interesting perspective. 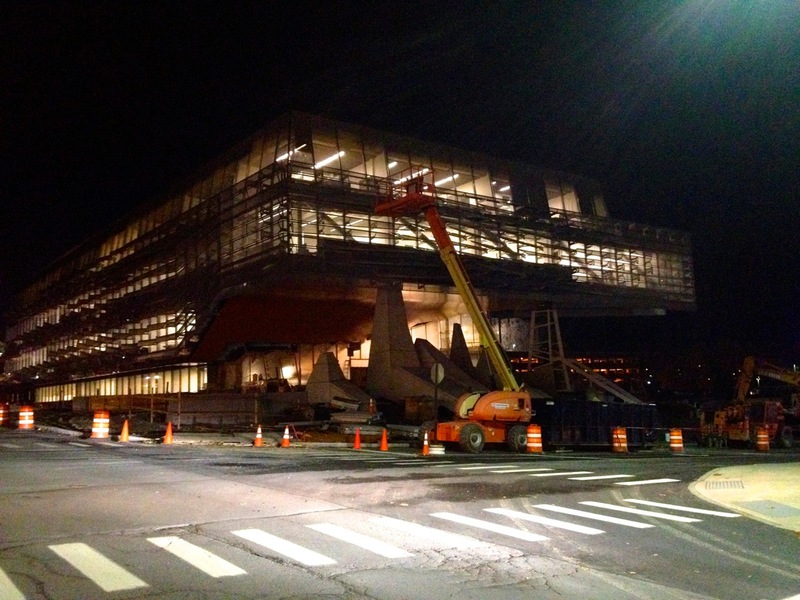 These came out quite grainy, but hopefully they give a sense of what this building looks like at night. 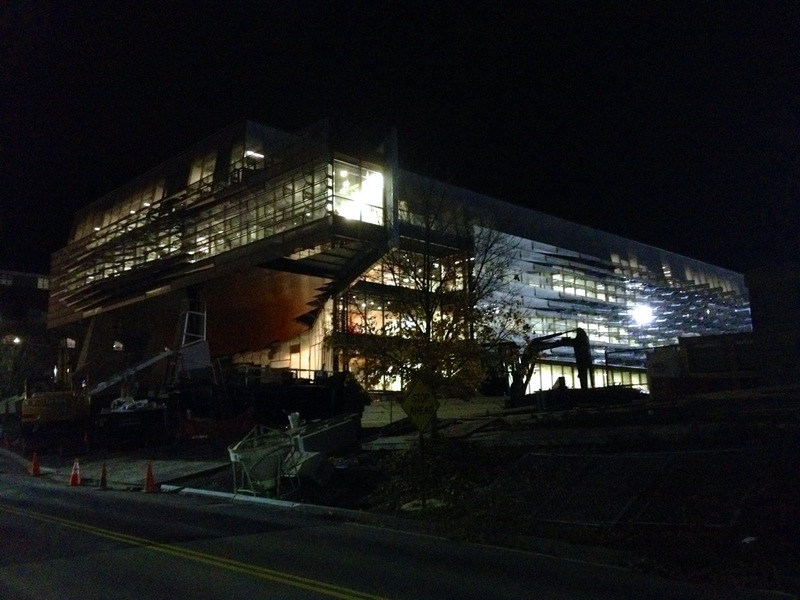 With all the glass, it’s lit-up like a Christmas tree on every floor, and I imagine the new entryway will have a bunch of floods illuminating the cantilever ceiling, as well as plenty of spots lighting the entryway. 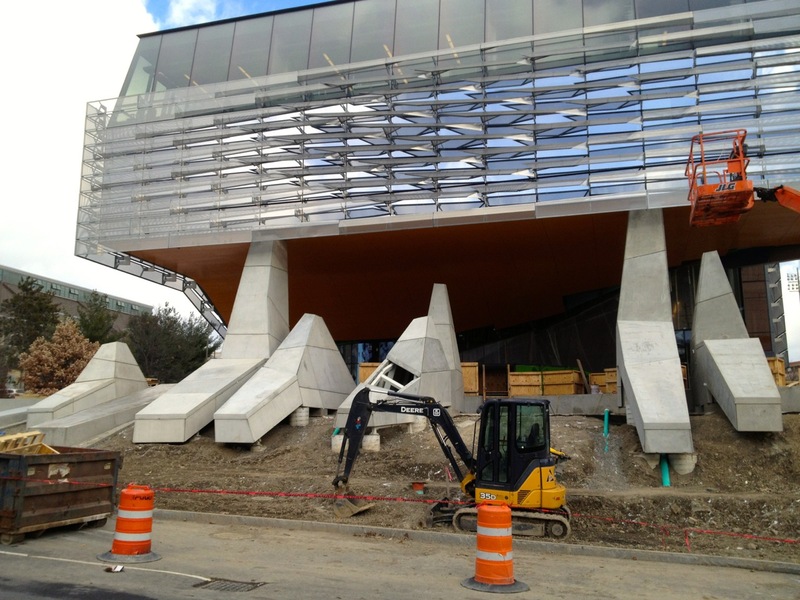 Speaking of the entry, the feet-structures are still coming along, and there’s a new concrete wall along the corner of Hoy and Campus Roads, where the level entry will be (the opposing side will have stairs from the sidewalk, shown below). 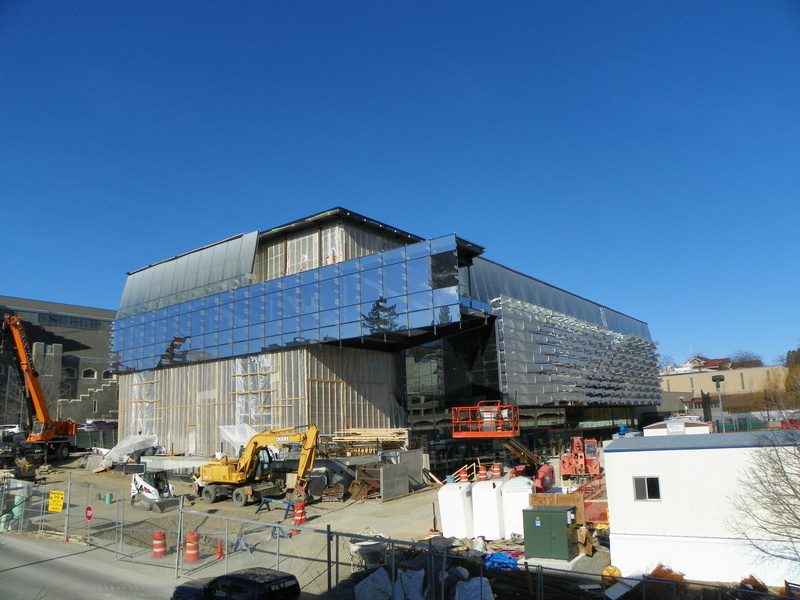 The construction fence outside Gates Hall has been taken down and now you can get a really good perspective of what this building looks like. 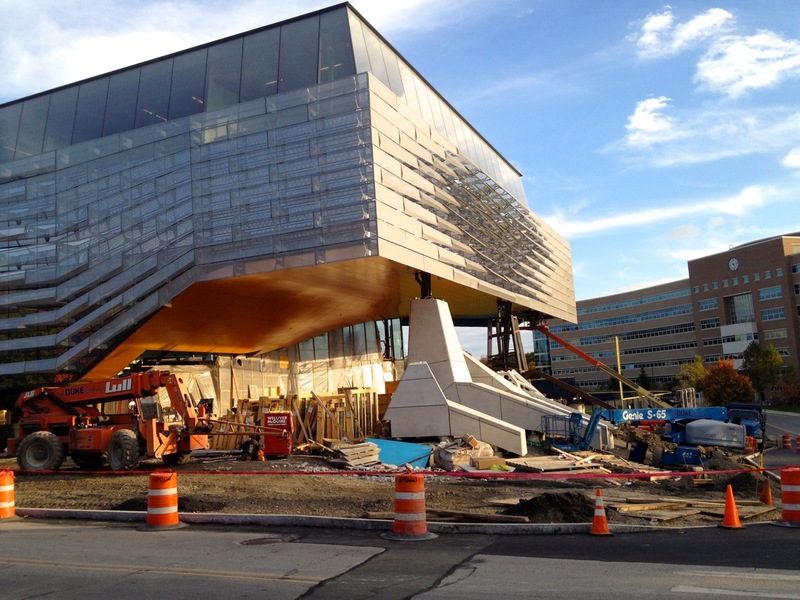 The entryway has been ongoing since around July, and there was a contractor working on the ceiling panels of the cantilever when I stopped by; there will be a section of what looks like a steel-reinforced glass floor (see render below) for those that like to tempt feelings of vertigo. 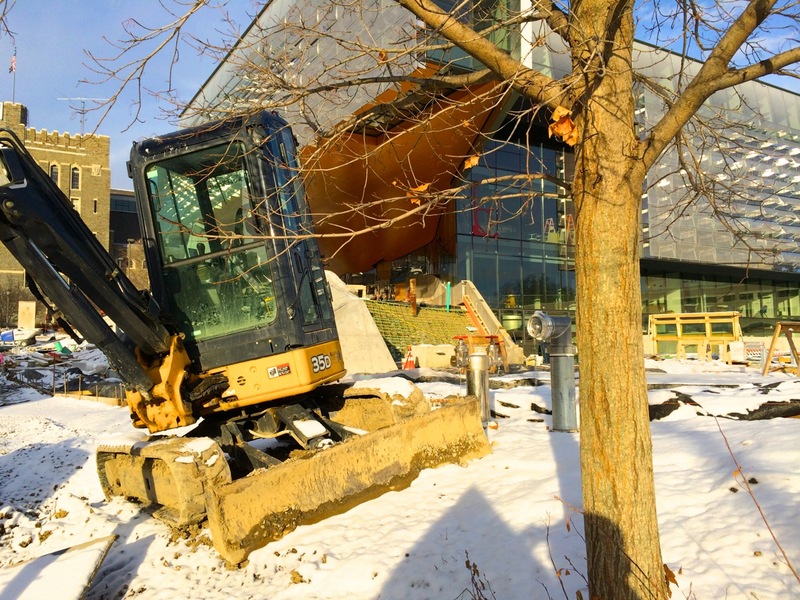 There’s a bunch of rebar and rebar sheets stacked on the site, so I think part of the fence being taken down is to make room for trucks to compact the soil and start hardscaping for the rest of the entry. 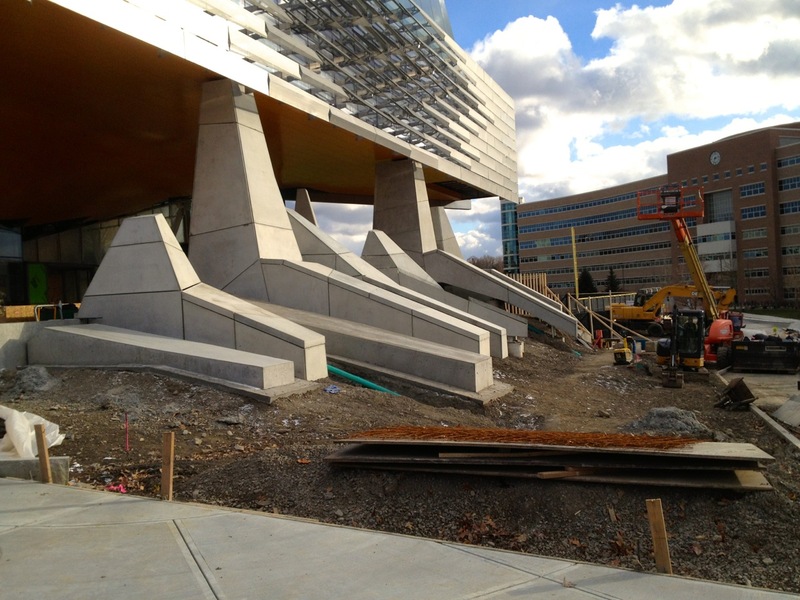 There’s also new curbing all the way around the site edges, and new asphalt. 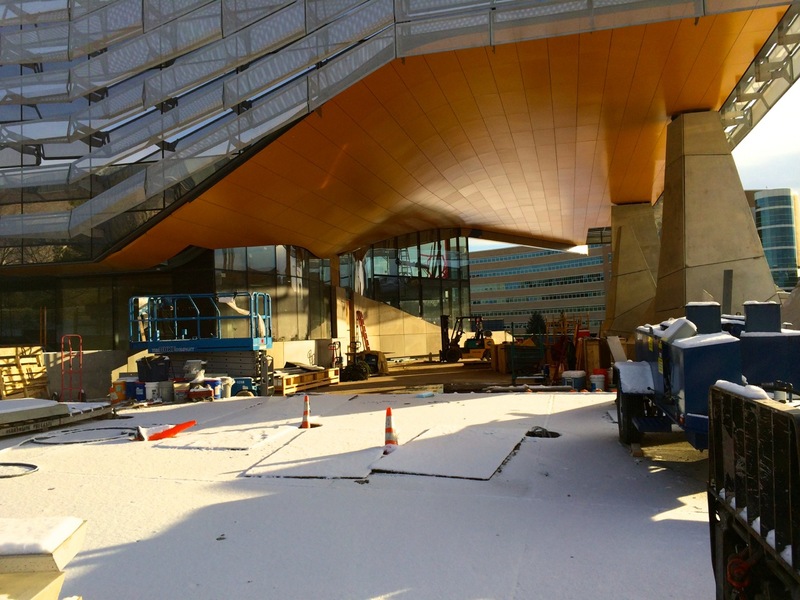 More entry assembly work here, and the swooped ceiling panels look completed, providing a nice contrast to the exterior facade. 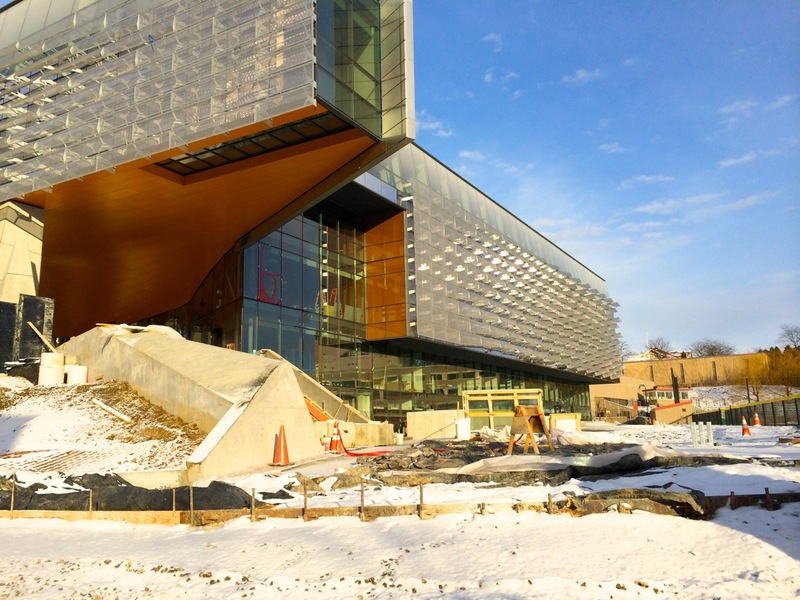 The construction should be finishing up in December so that SCI can move-in January to be ready for the Spring 2014 semester. 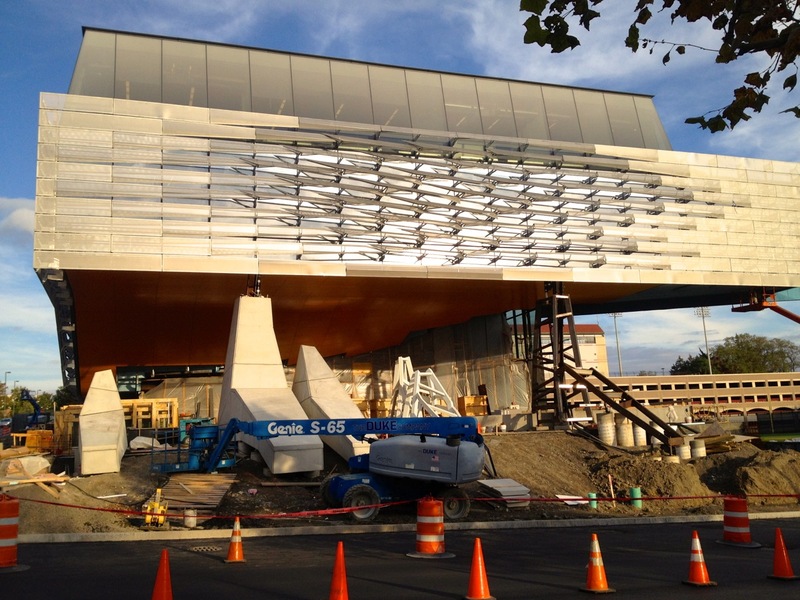 Just learned some new info here: the metal shading structures on the exterior facade are done by the A. Zahner Company, a firm out of Kansas City, MO that fabricates custom metalwork for projects all over the world. 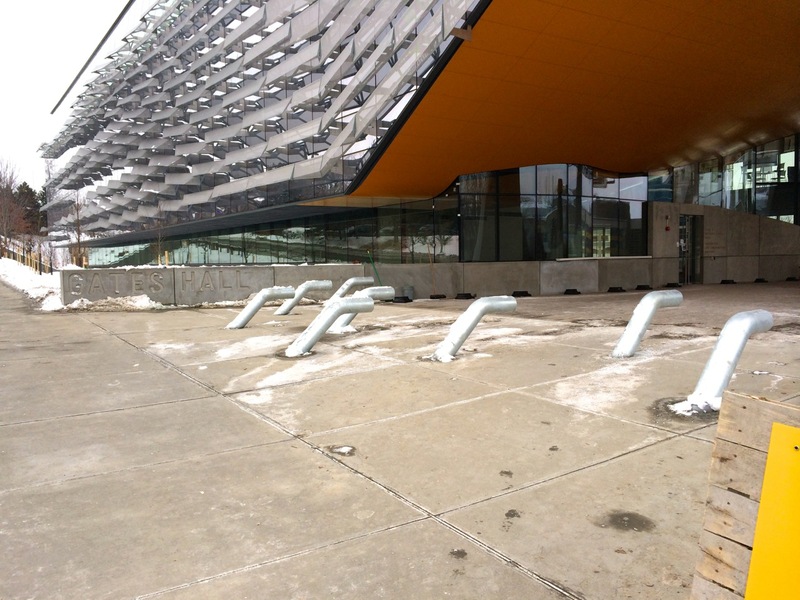 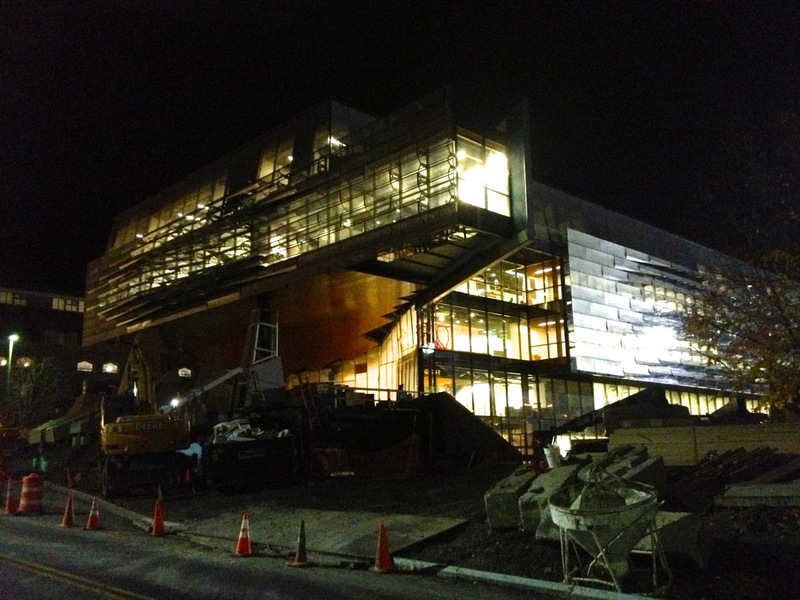 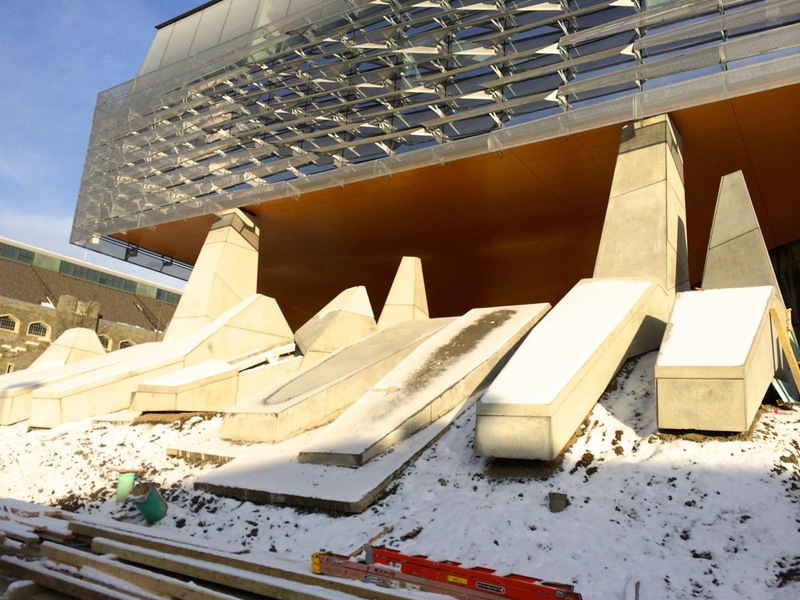 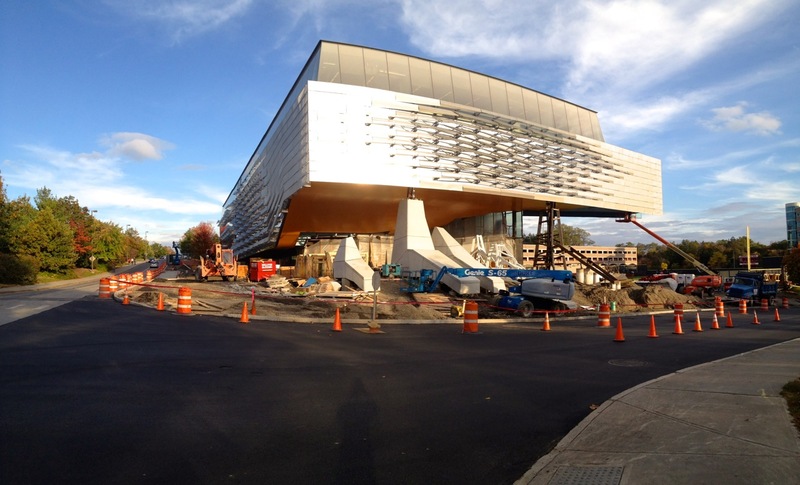 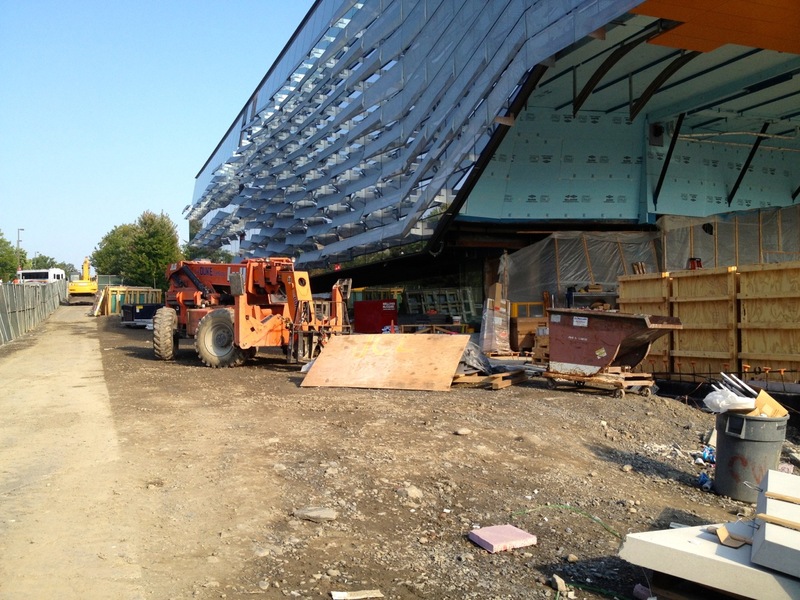 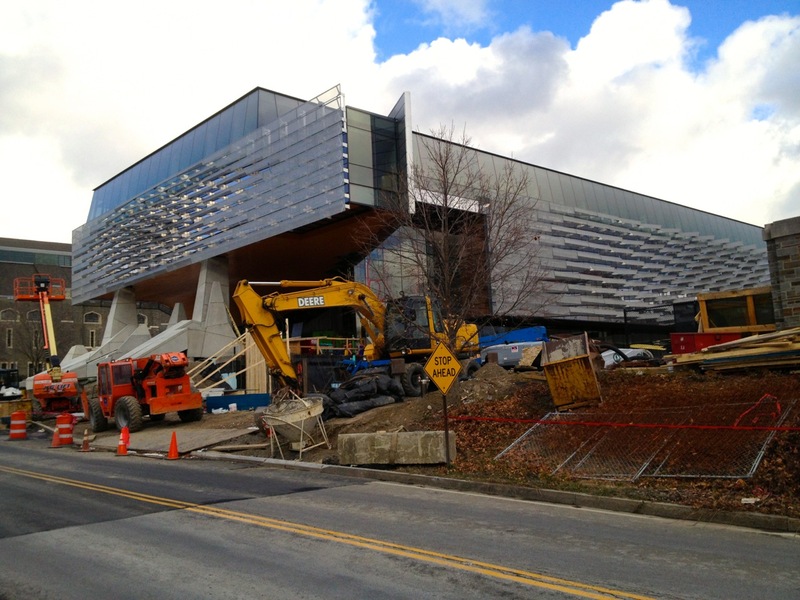 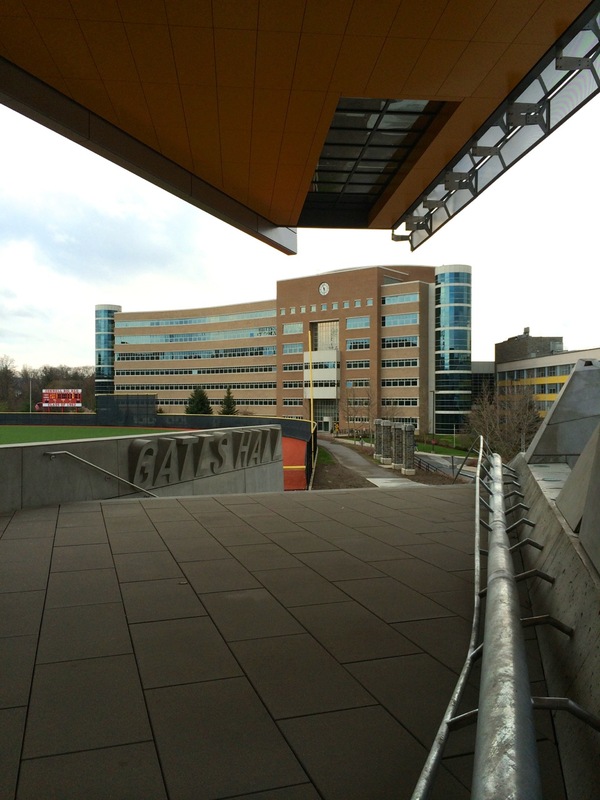 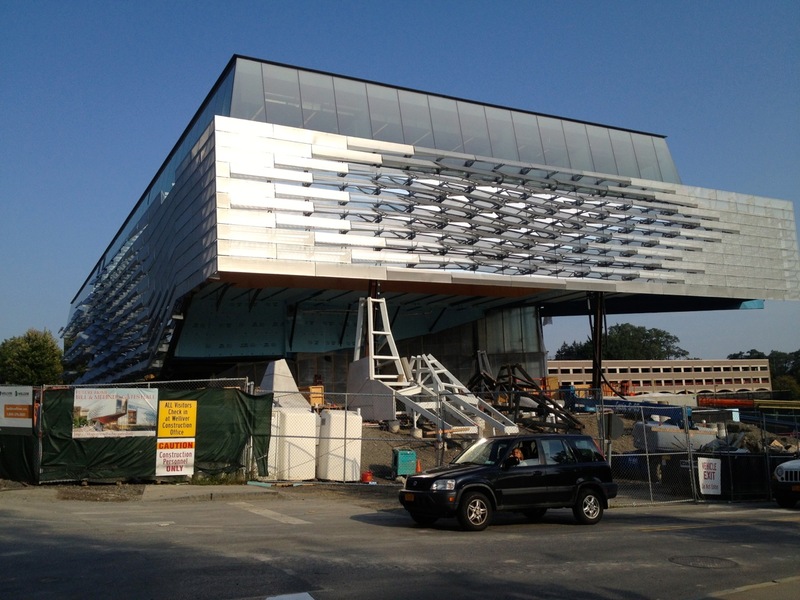 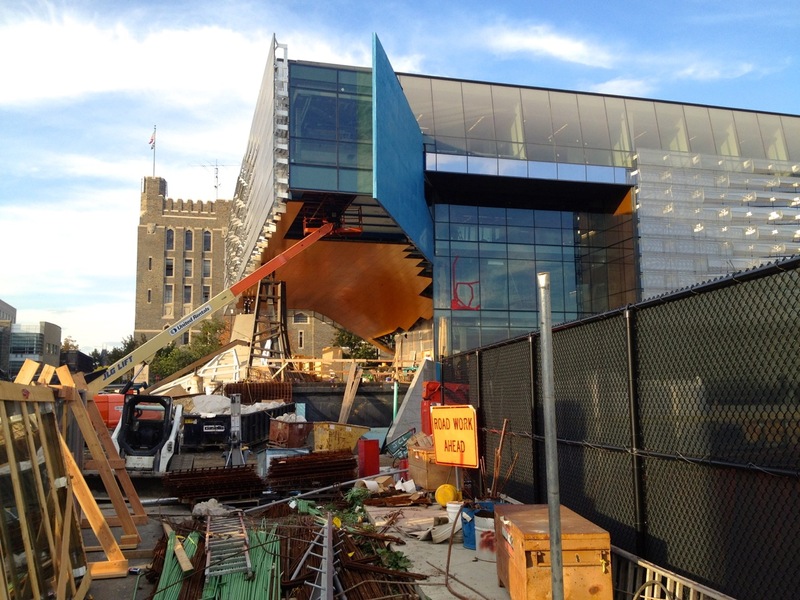 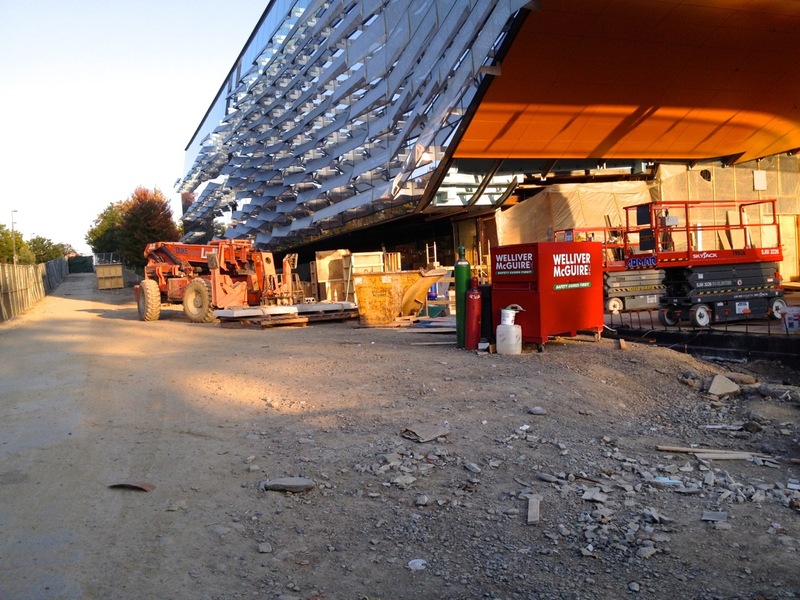 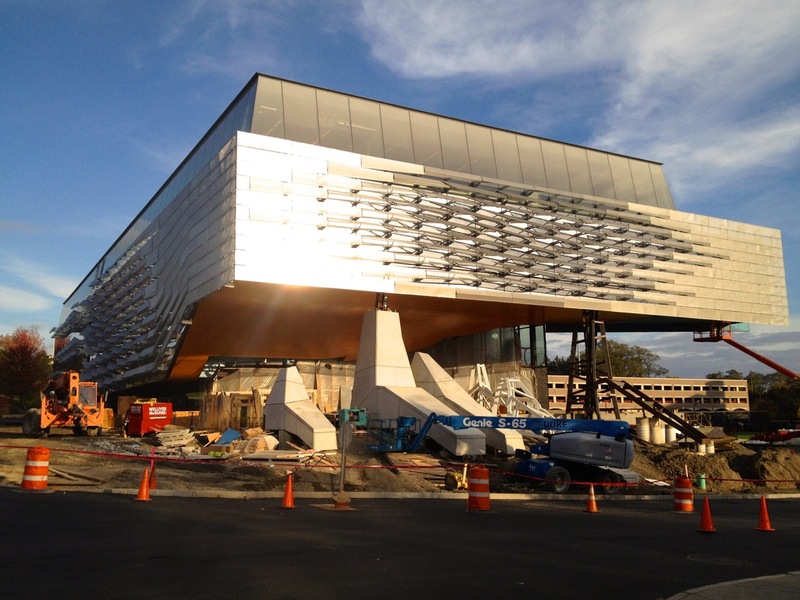 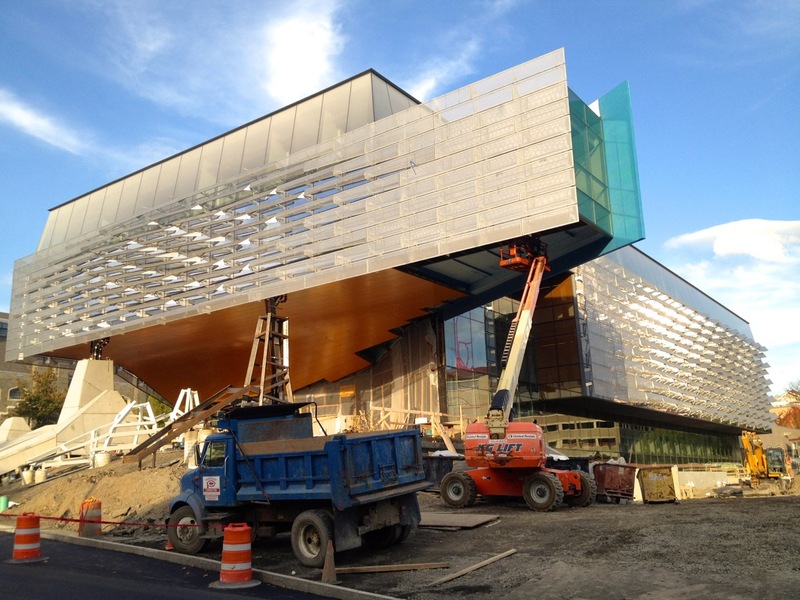 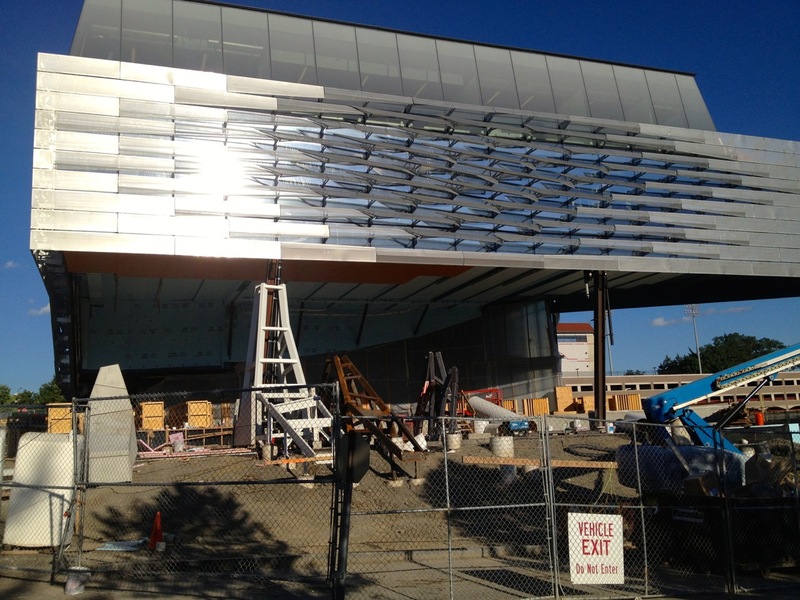 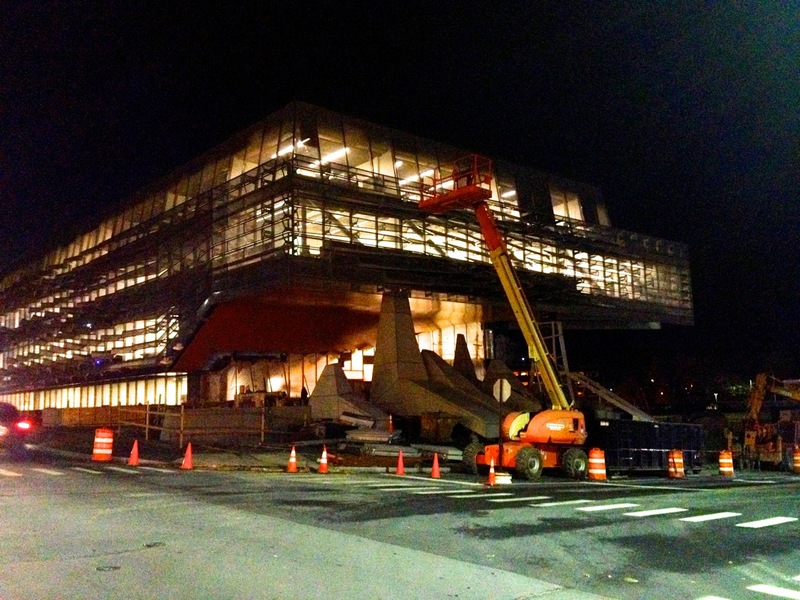 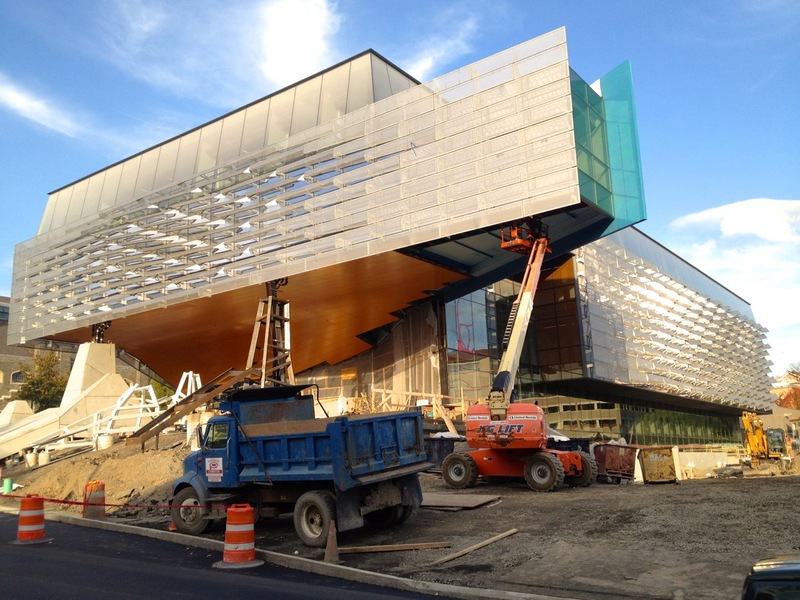 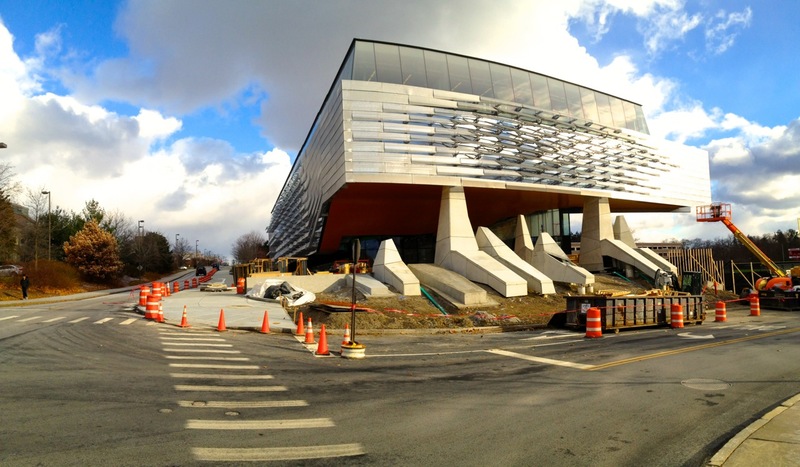 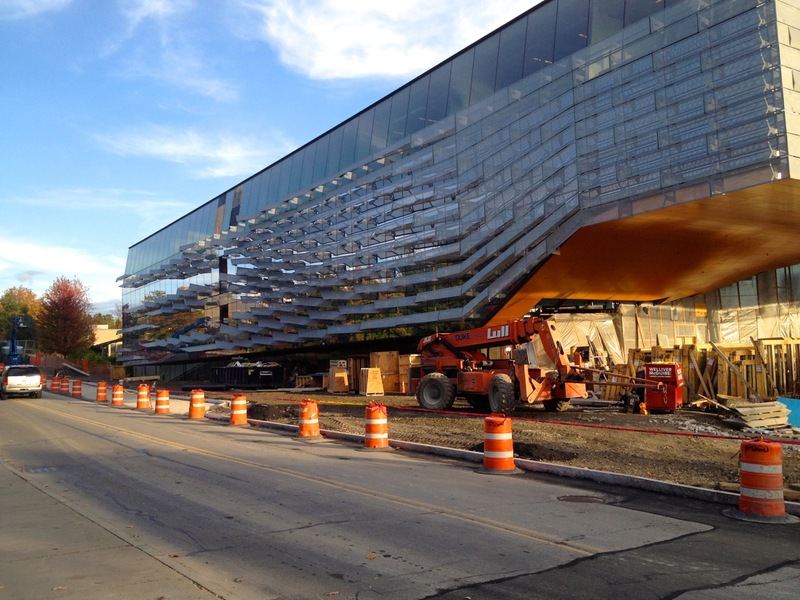 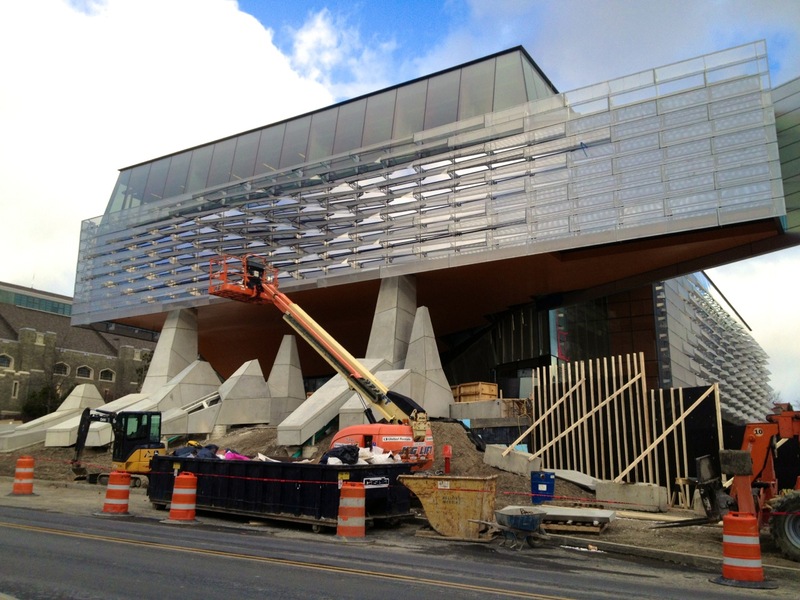 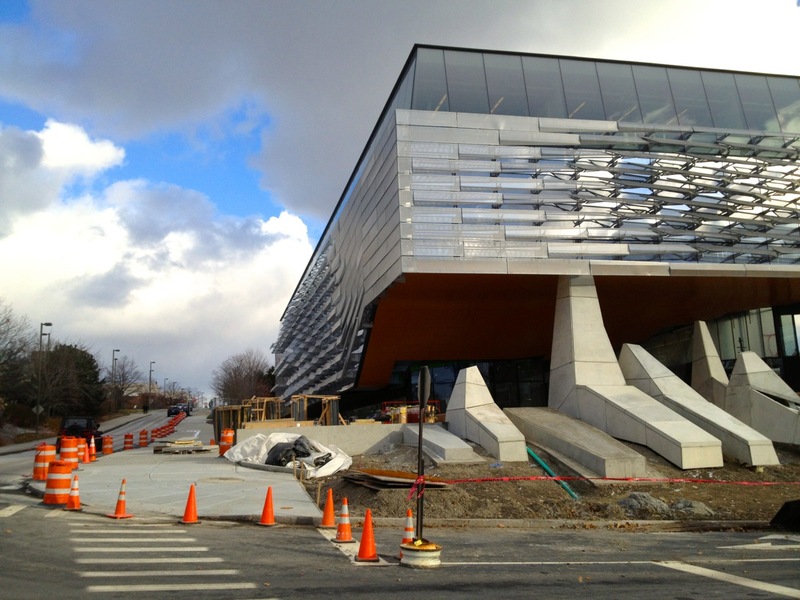 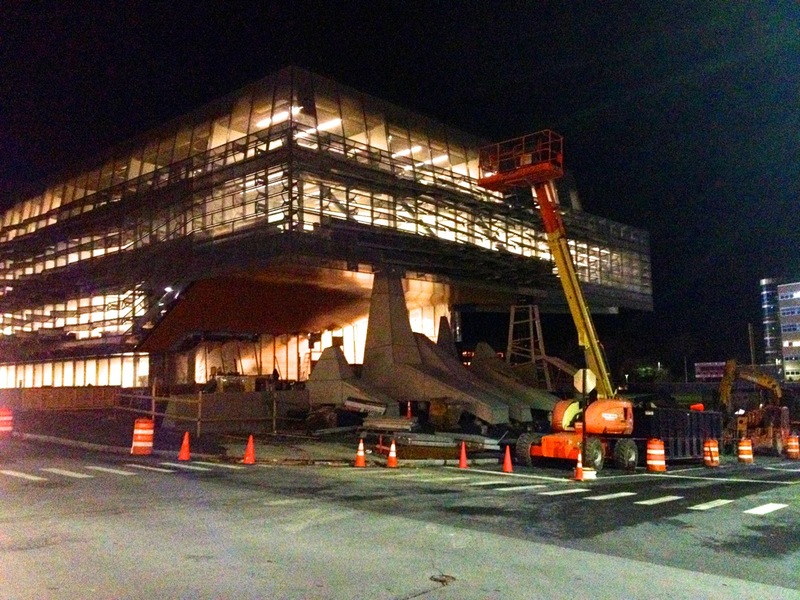 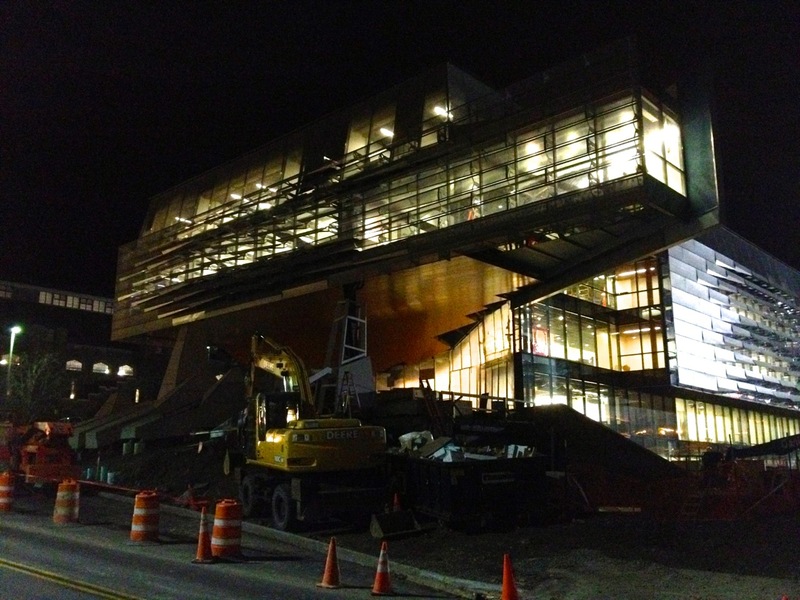 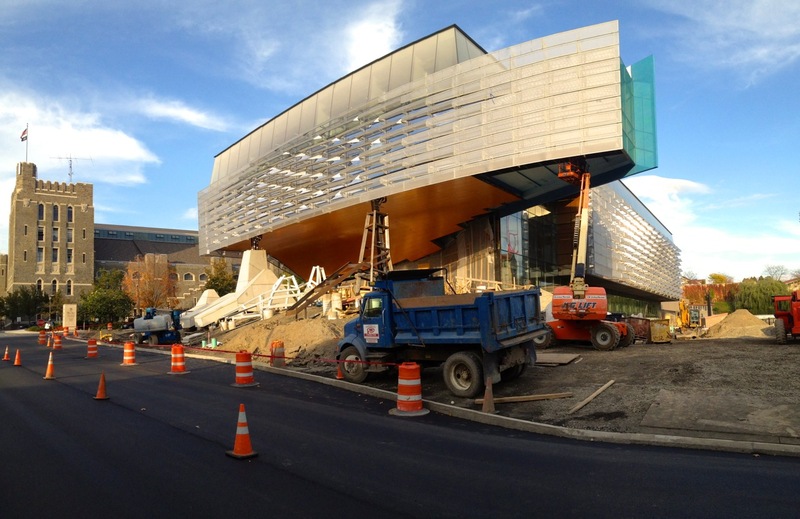 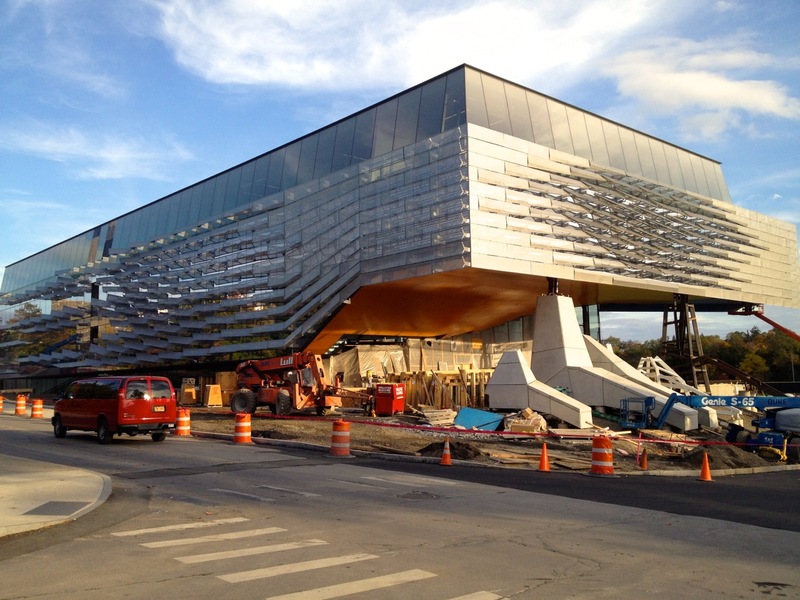 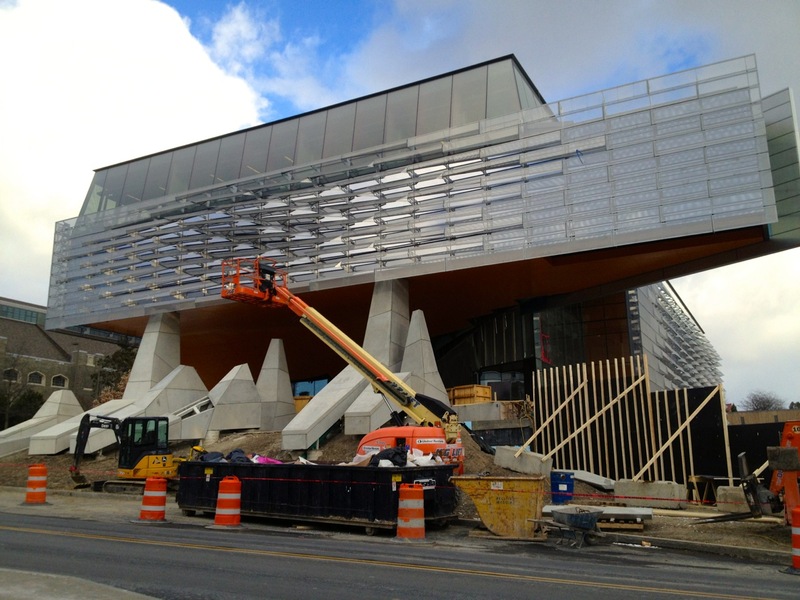 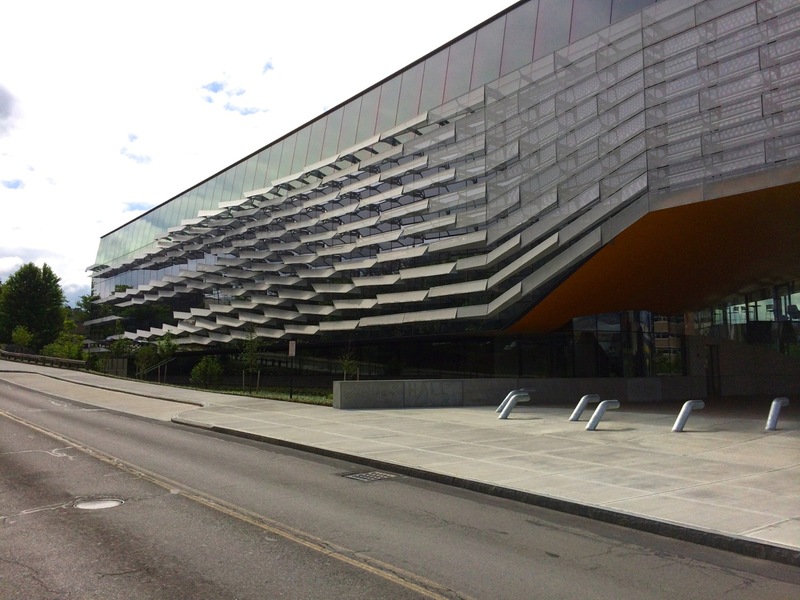 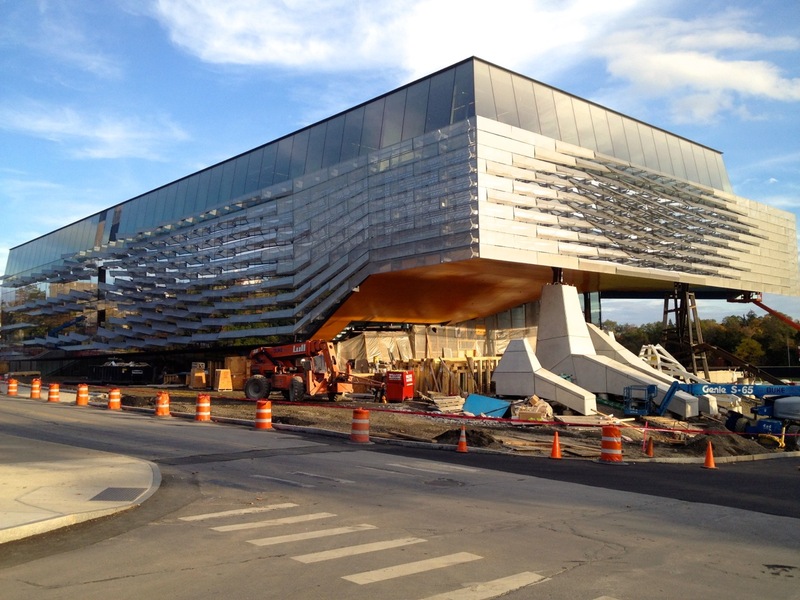 Just some updated photos of Gates Hall from last week- entryway “feet” are growing. 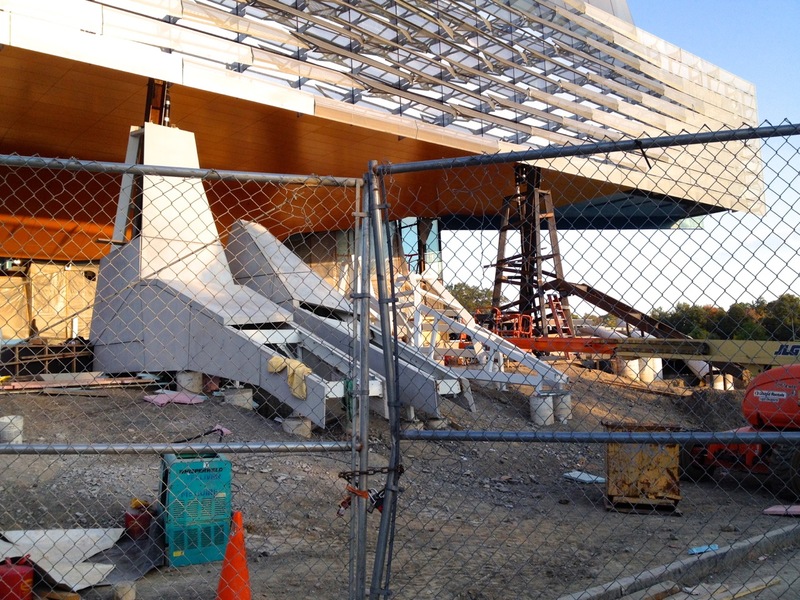 Wonder how heavy those concrete blocks are..
Not much to see here on the outside, but the entryway work has a couple more feet-like steel structures in place, and you can see a nice-looking woodgrain ceiling application underneath the cantilever. 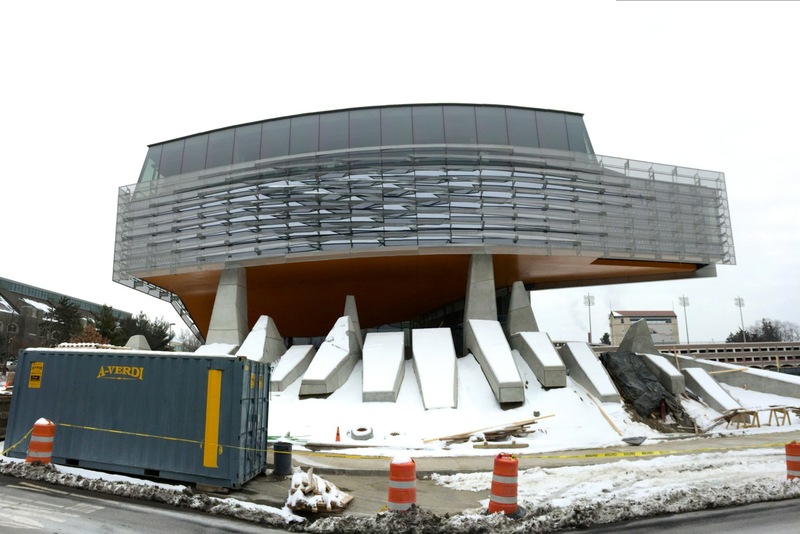 Excited to see the final product; without a doubt, it will probably be one of the coolest entries of any building in Ithaca.